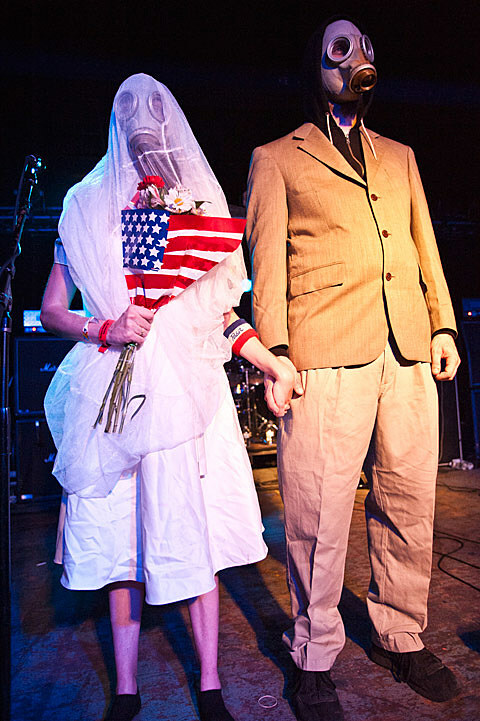 Hand in hand, the gasmask wielding pair strolled on to the stage to the sound of air raid sirens. 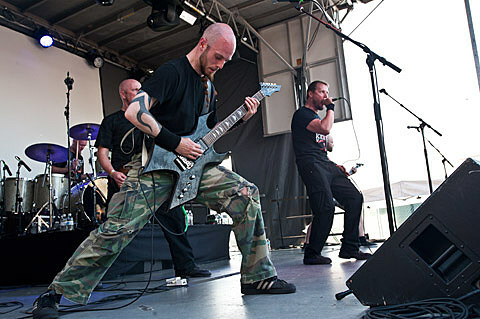 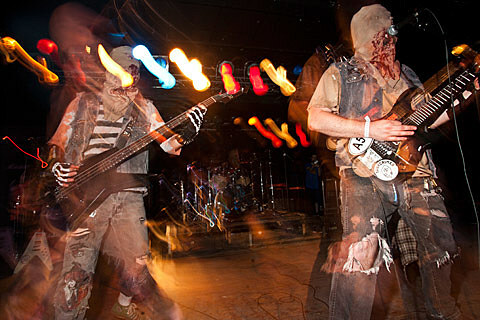 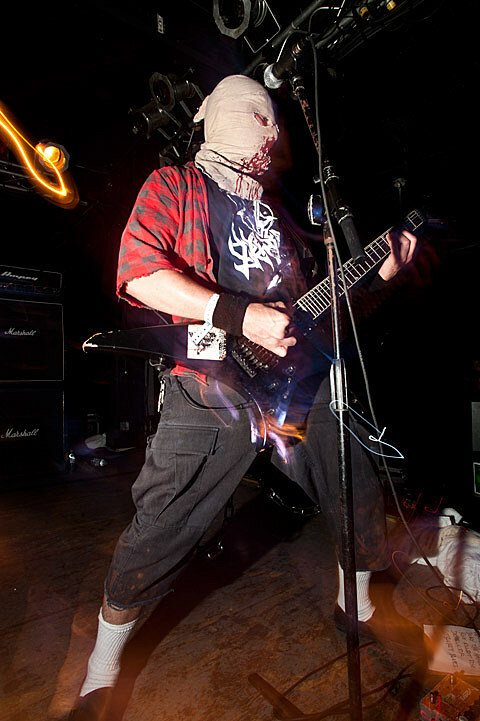 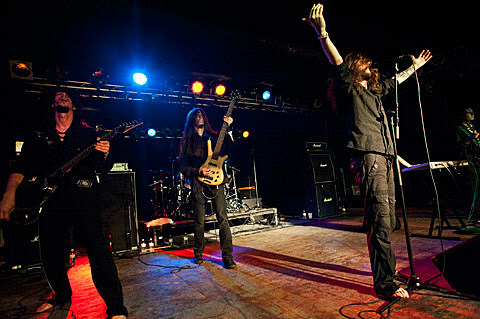 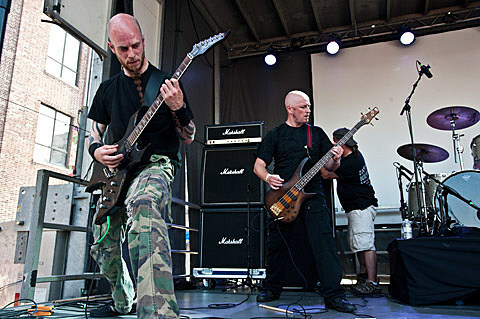 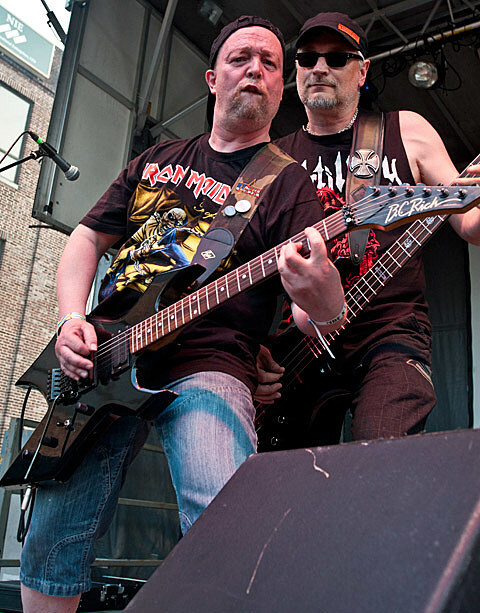 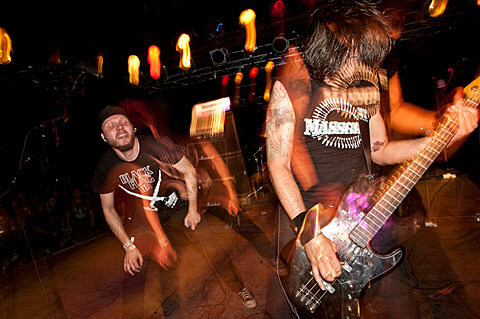 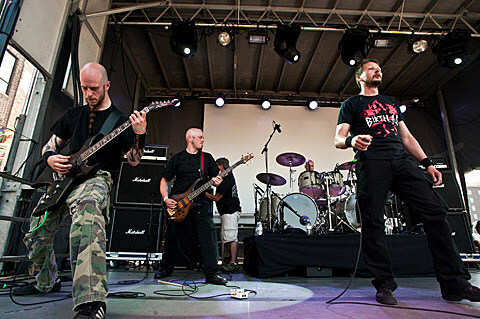 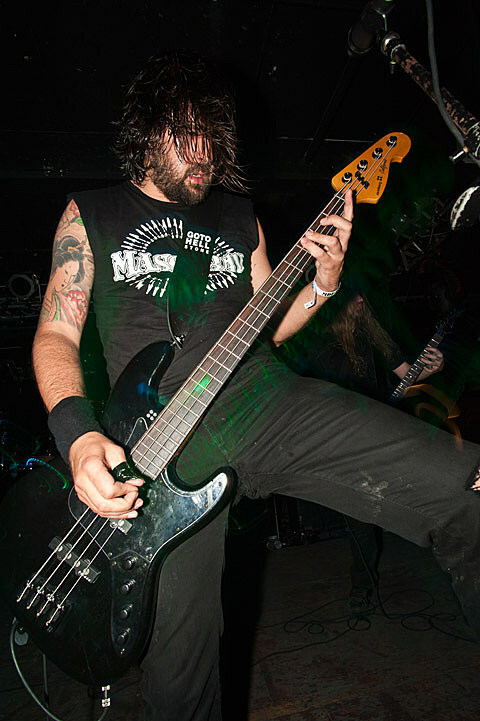 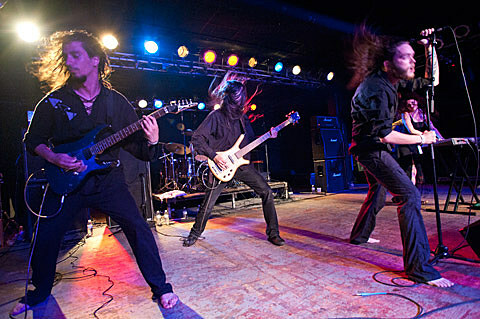 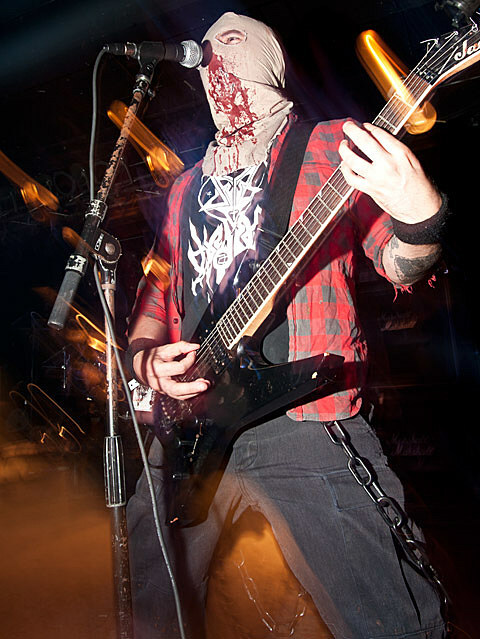 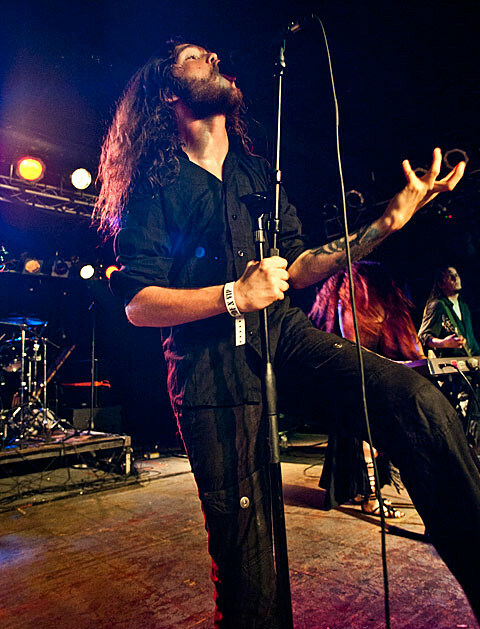 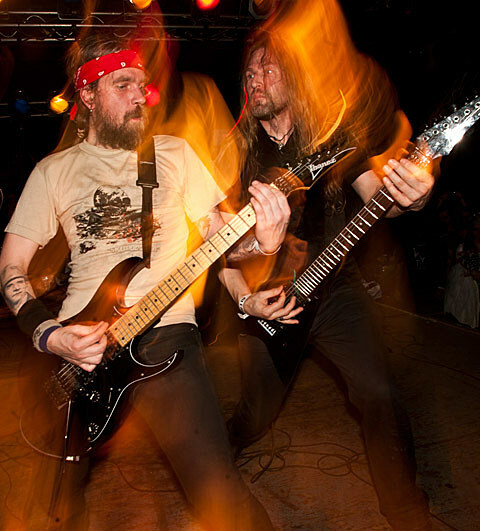 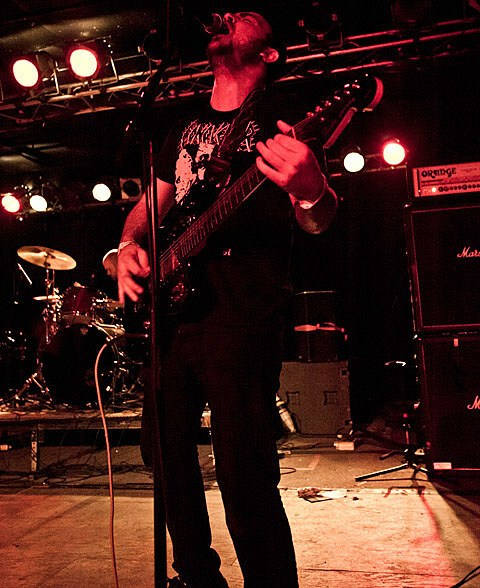 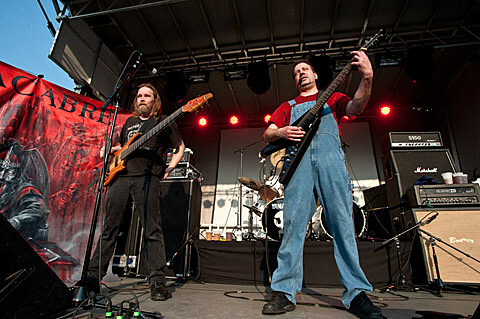 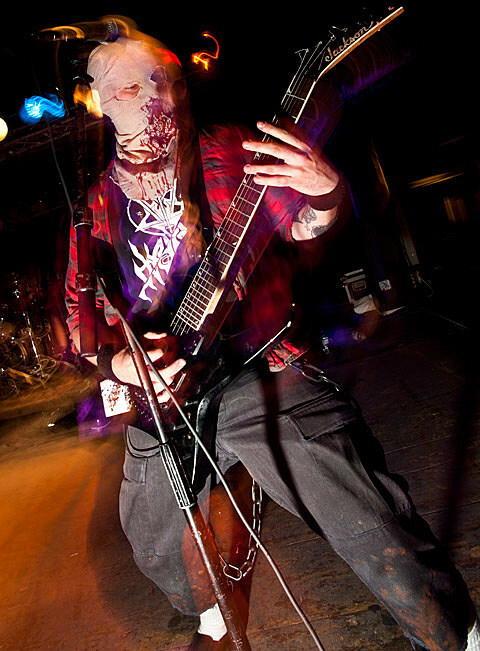 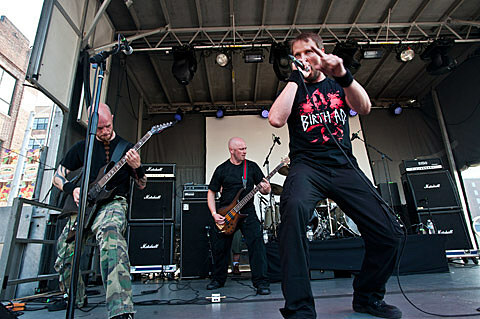 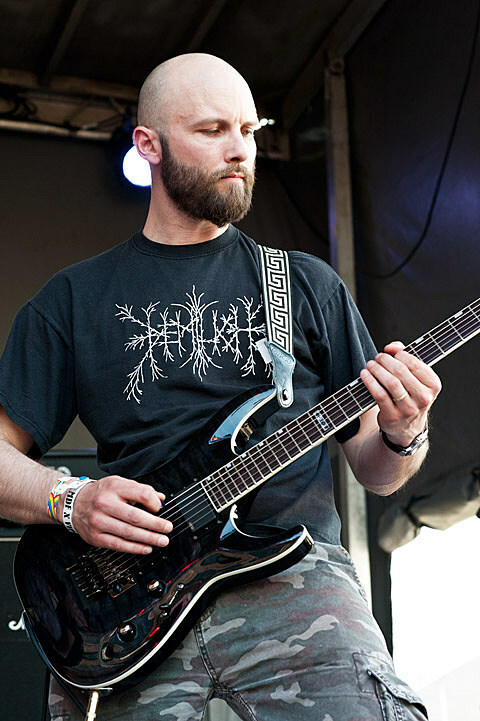 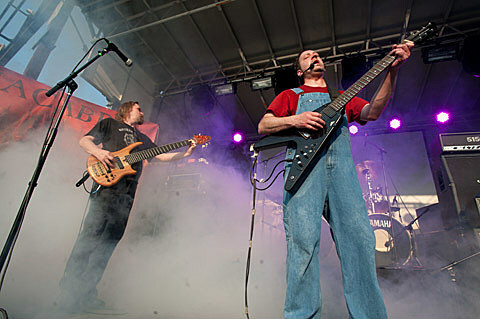 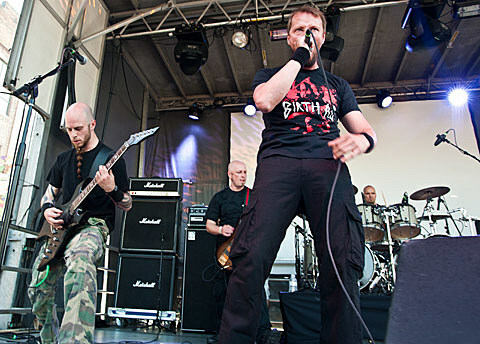 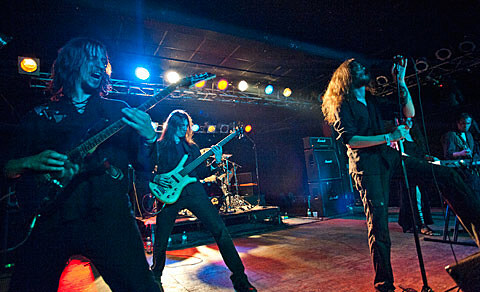 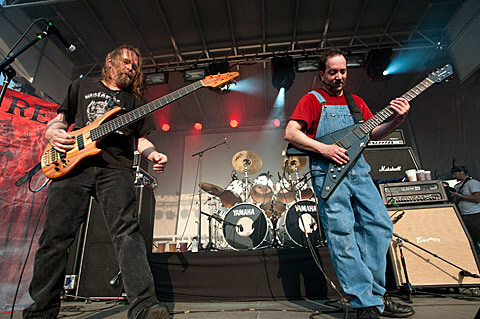 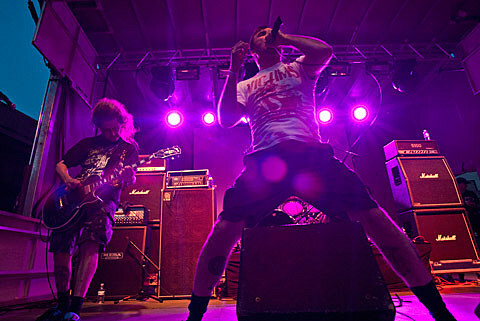 Their arrival announced the coming of reunited grindcore greats Nasum, one of the headliners at Maryland Deathfest on May 25th playing their farewell round of shows. 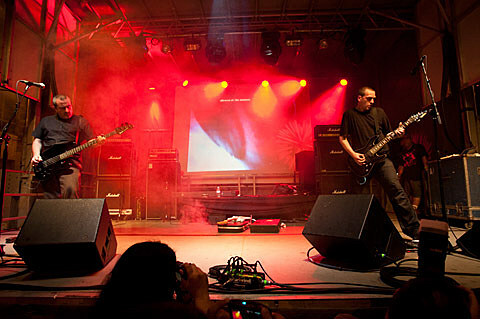 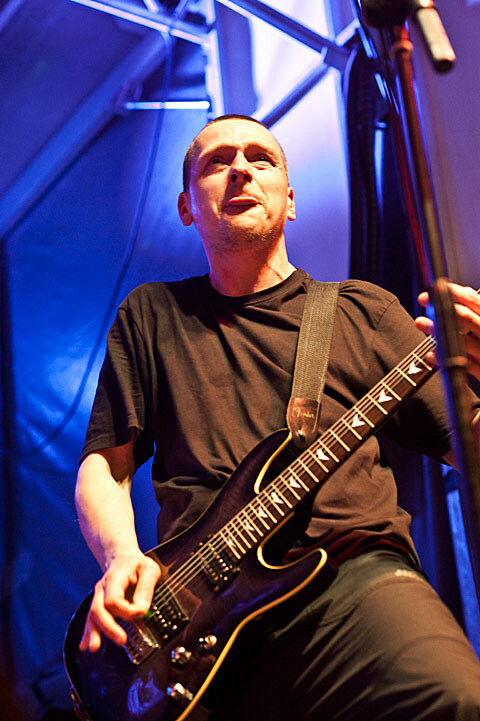 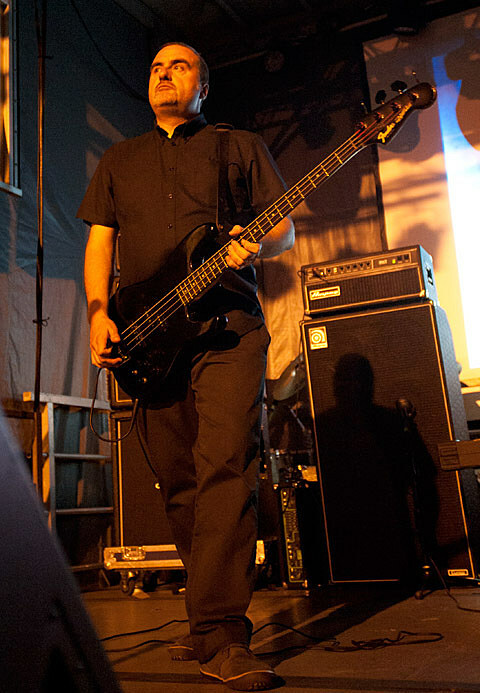 A rare appearance from Godflesh and related band Napalm Death (Godflesh‘s Justin Broadrick was an early member of ND) were the night’s outdoor (read: true) headliners, playing the large stages and rounding out a lineup that included campy thrash, Swedish death metal, noisecore pioneers, Romanian black metal and many stops in between. 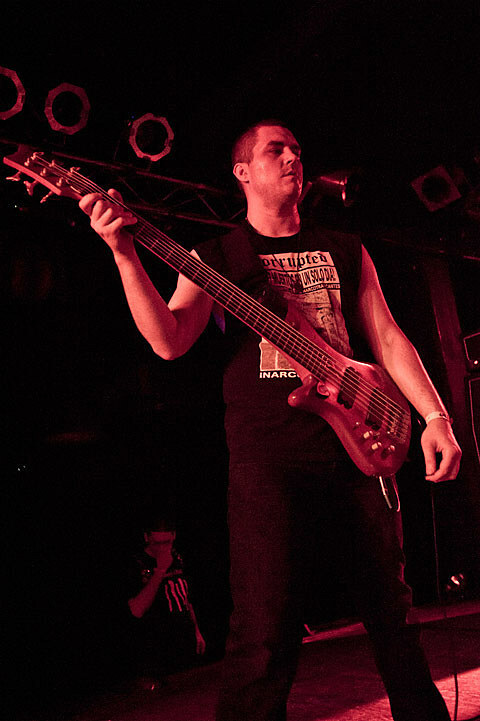 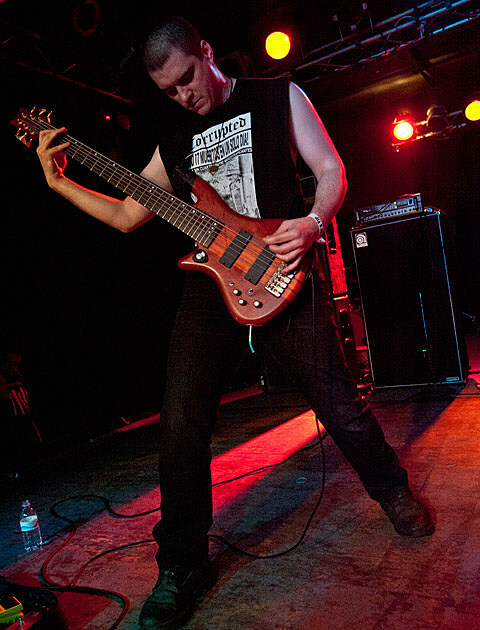 Brooklyn’s Castevet opened the show at 3:30PM, sporting new bassist Nick McMaster (also of Krallice). 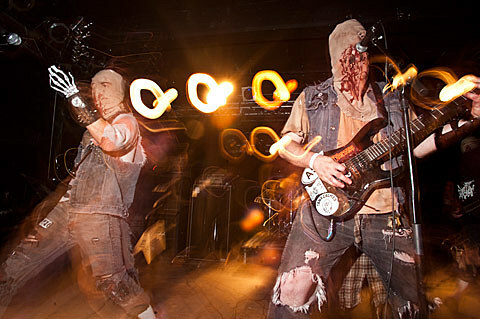 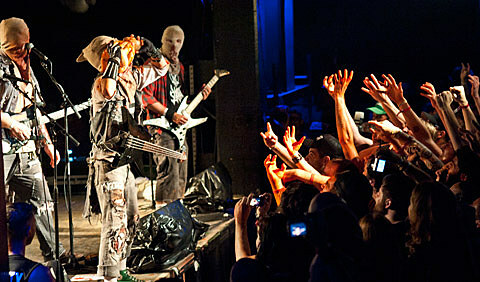 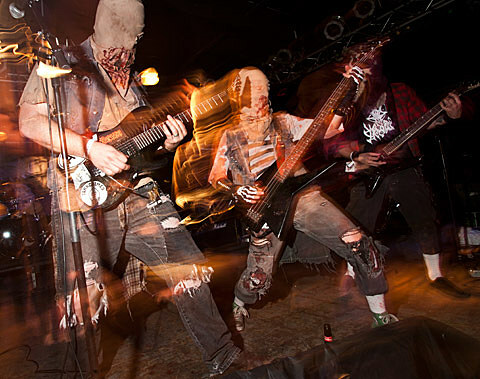 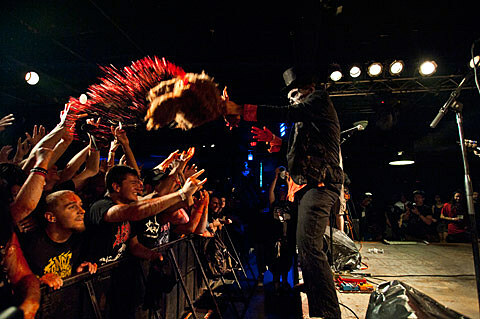 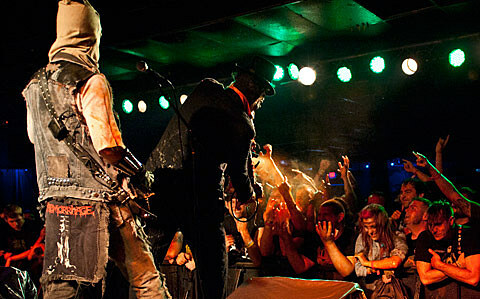 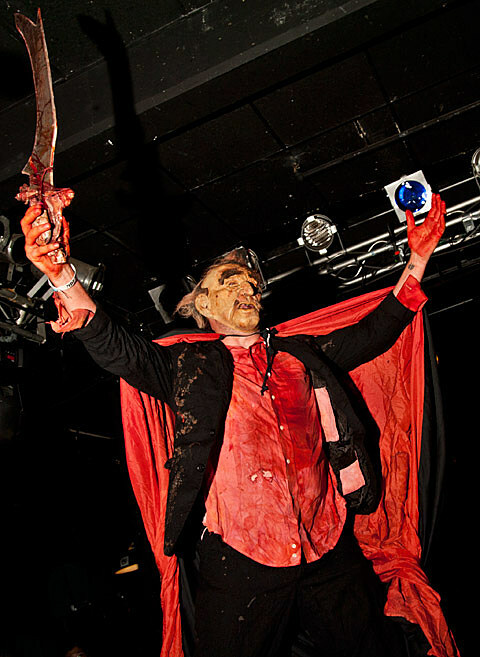 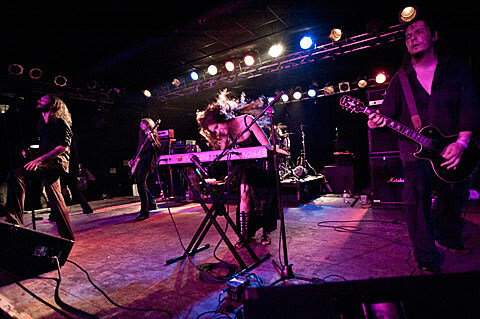 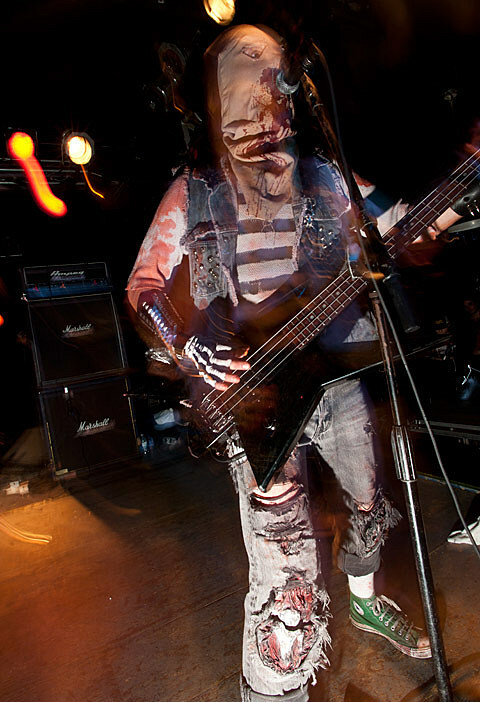 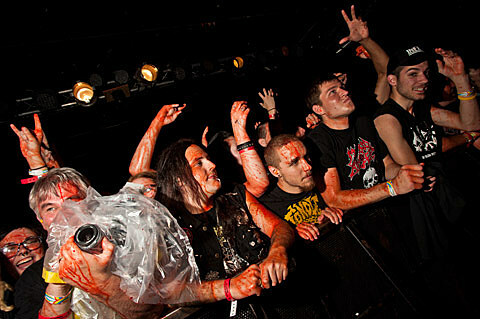 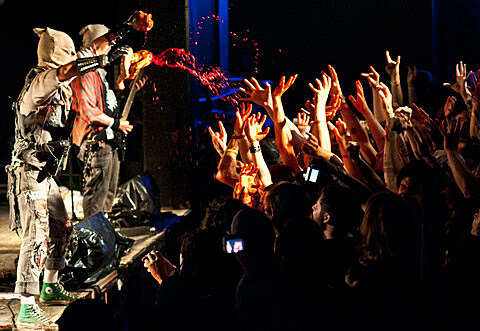 I missed the next band Nashgul (and would later miss Setherial in the same room), but managed to catch the campy and fun Ghoul, who take cues from their ex-tourmates Gwar in the theatricality and dousing-the-audience-in-“blood” arenas. 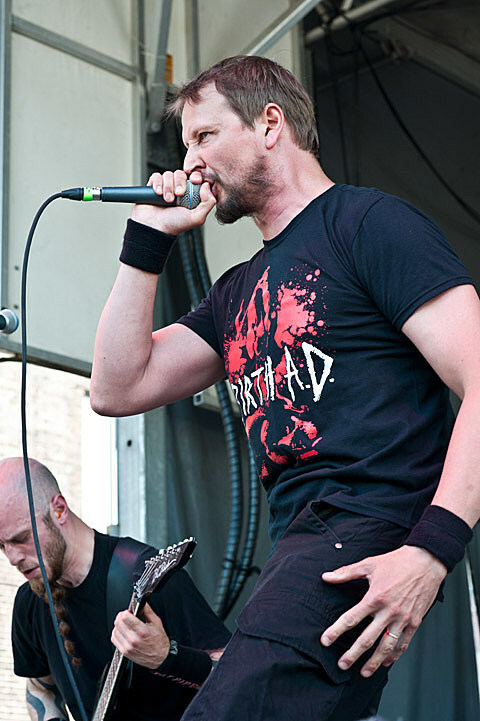 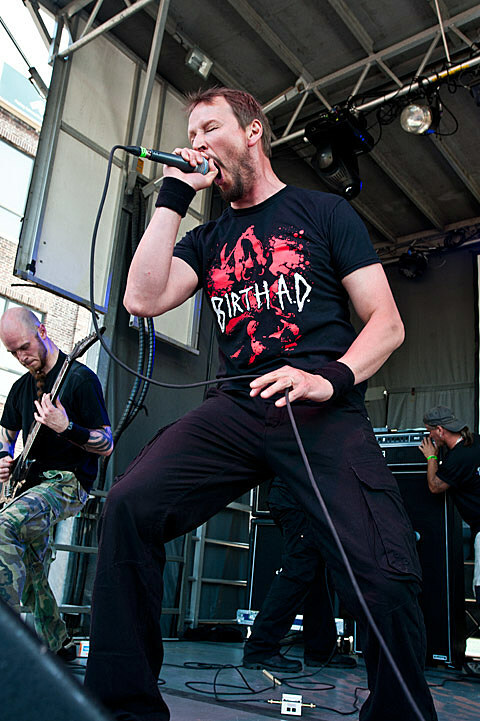 Finnish death metal crew Demigod, who were a highlight at Rites of Darkness, opened the outdoor stage and delivered a similarly inspired performance. 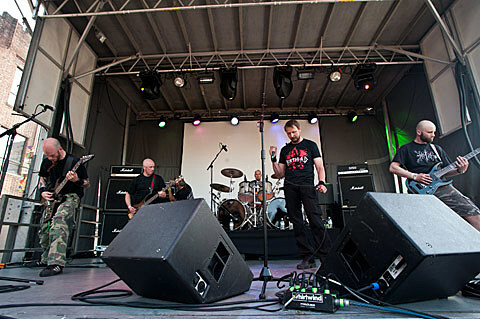 Today is The Day were next on the indoor stage, playing quite possibly my favorite performance from the band and definitely a highlight for the day. 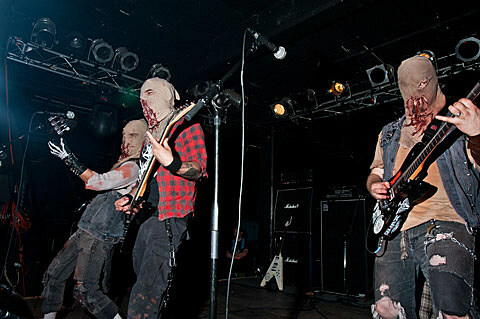 The band’s new lineup featuring the rhythm section of Wetnurse is a perfect match for Steve Austin’s madman antics, and I heard quite a few comments afterword to the tune of “I forgot how much I used to love Today is The Day”. 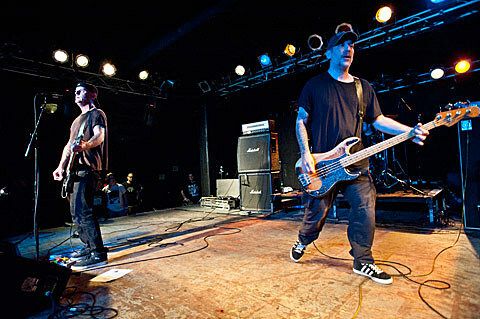 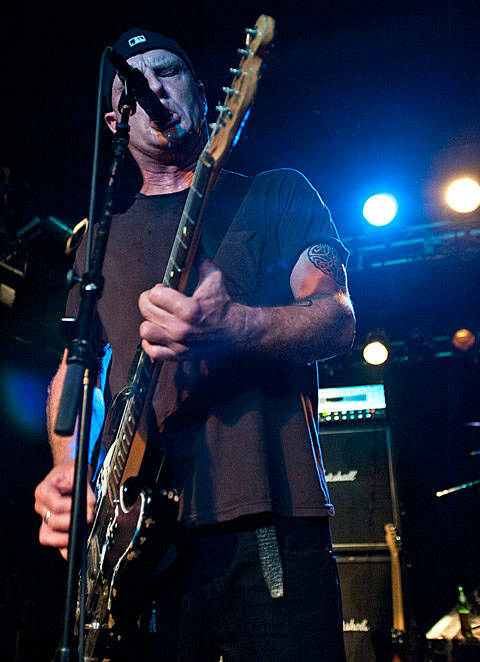 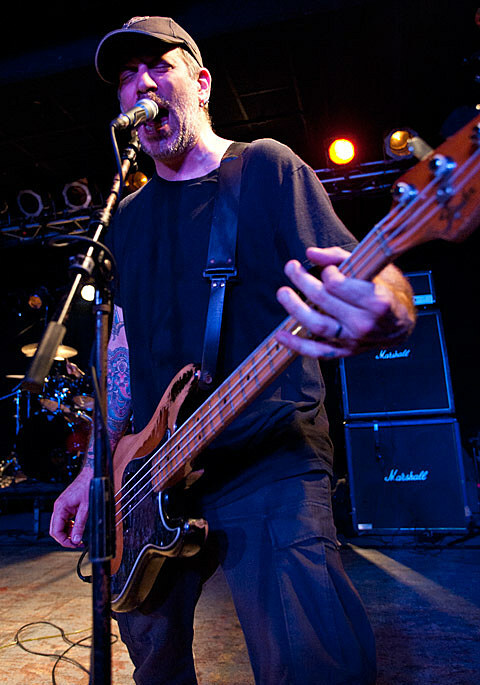 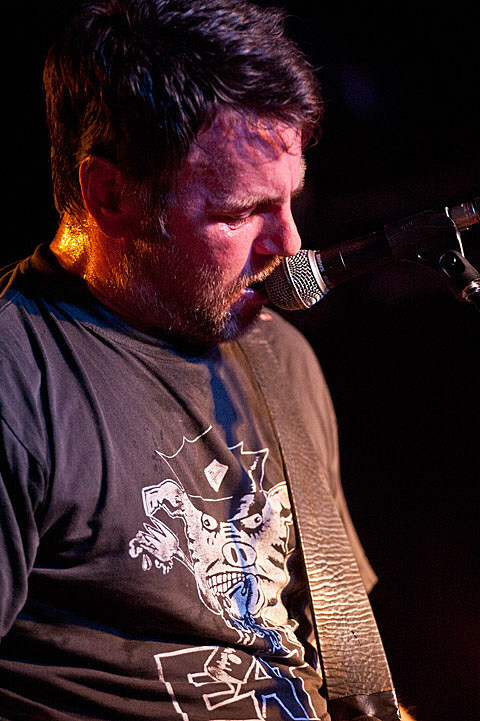 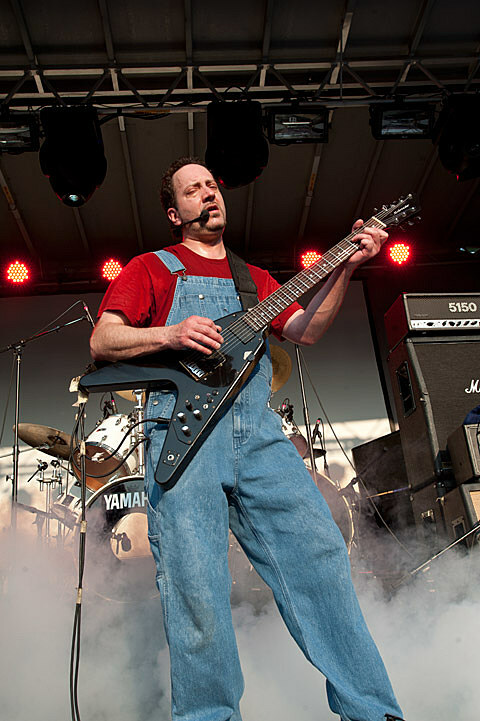 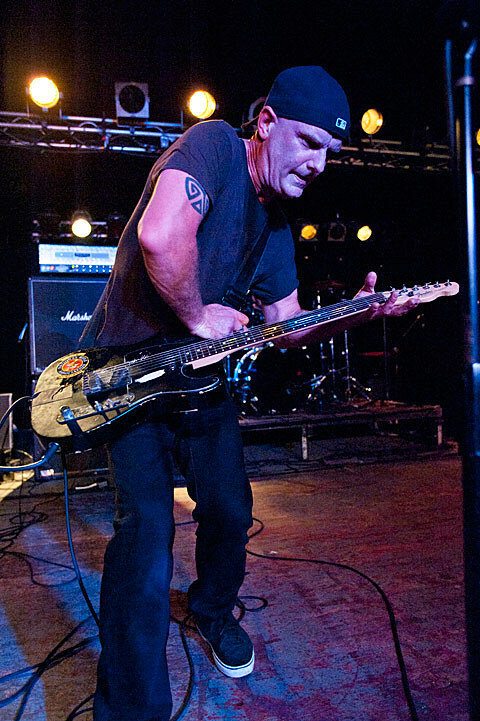 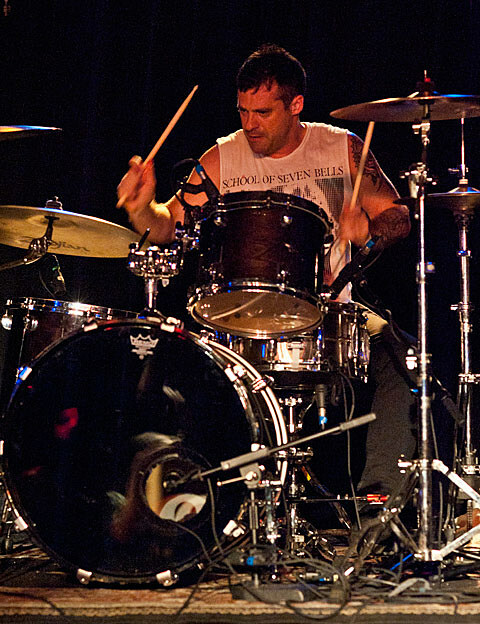 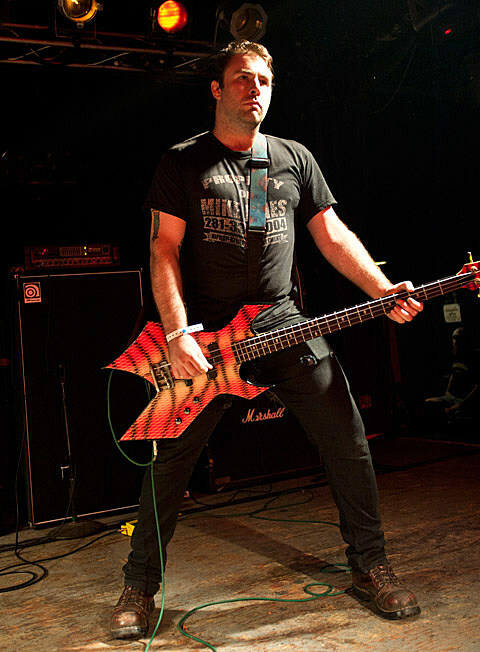 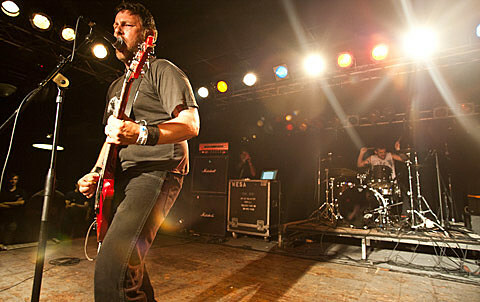 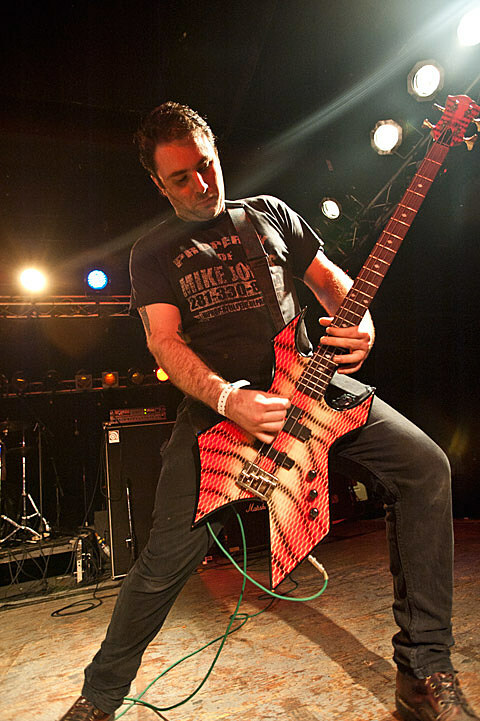 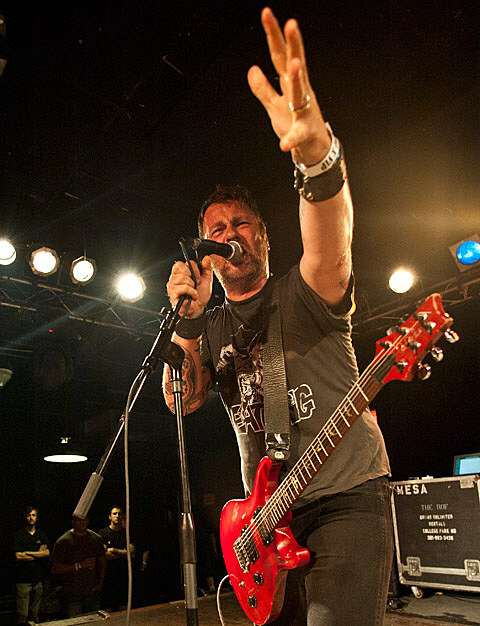 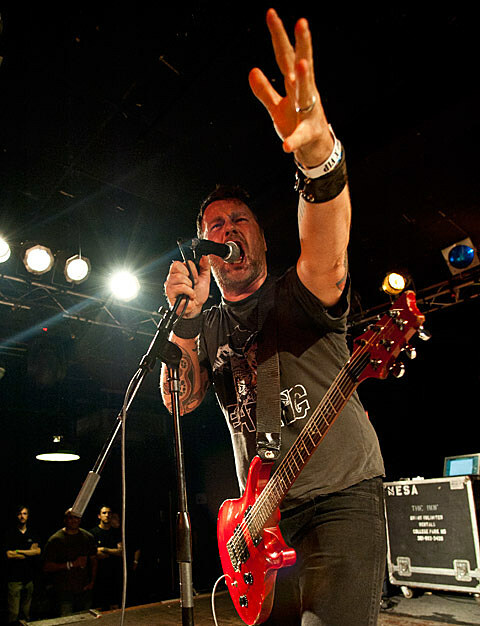 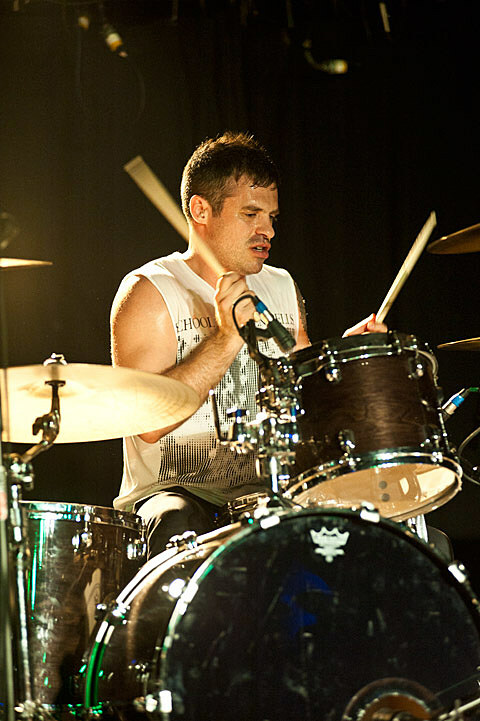 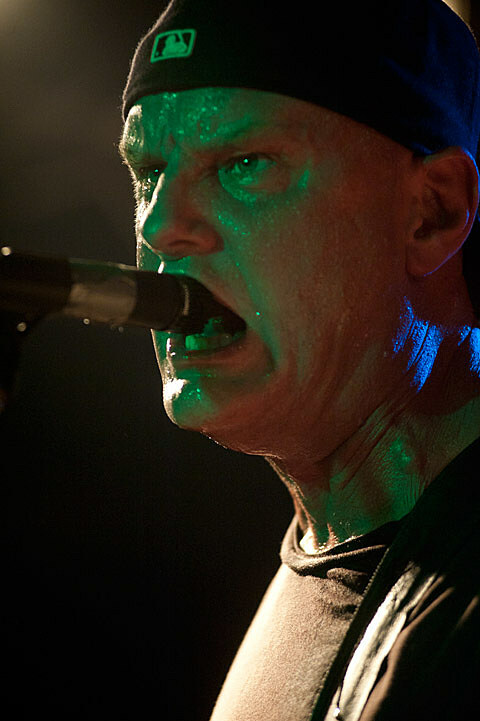 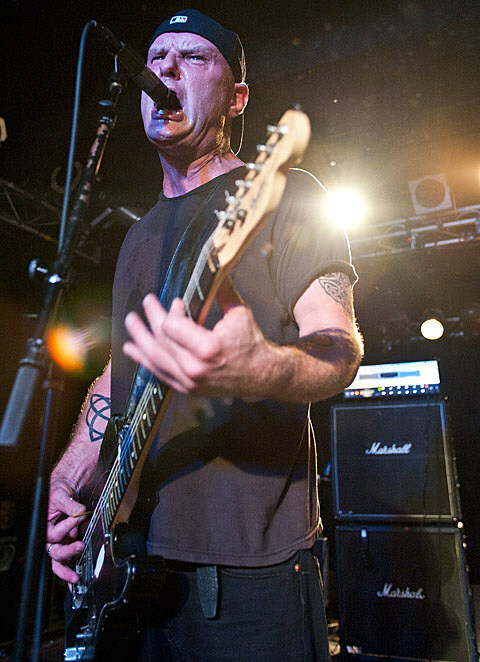 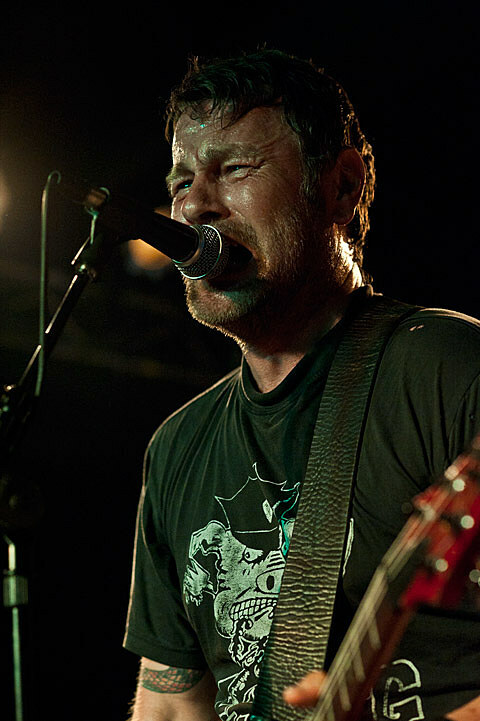 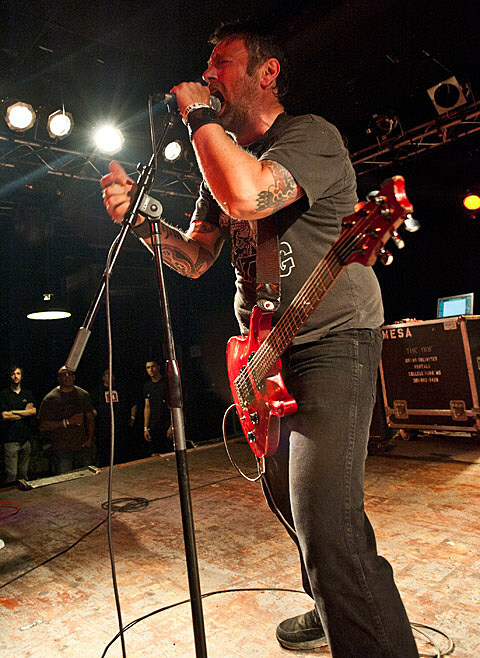 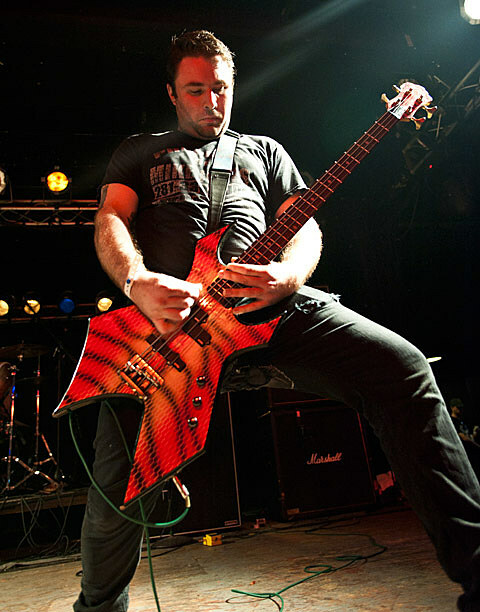 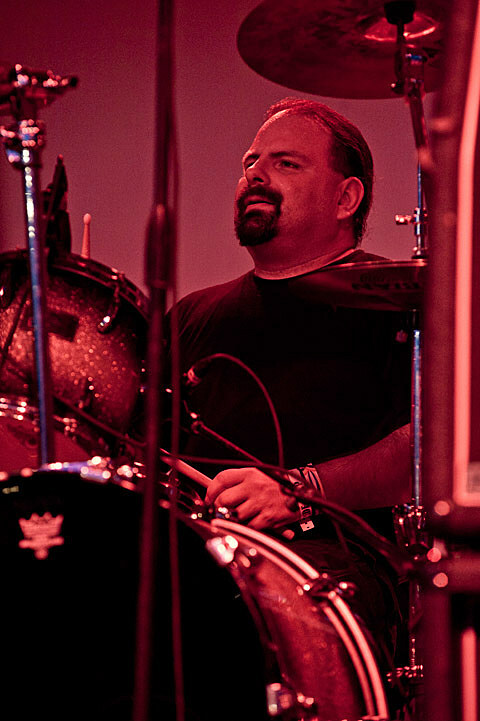 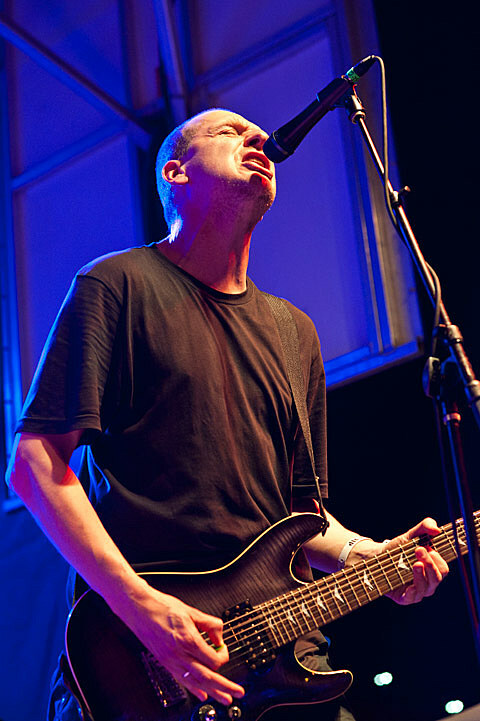 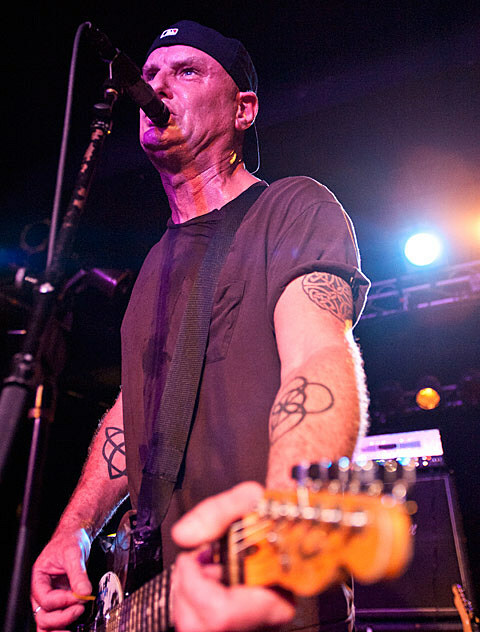 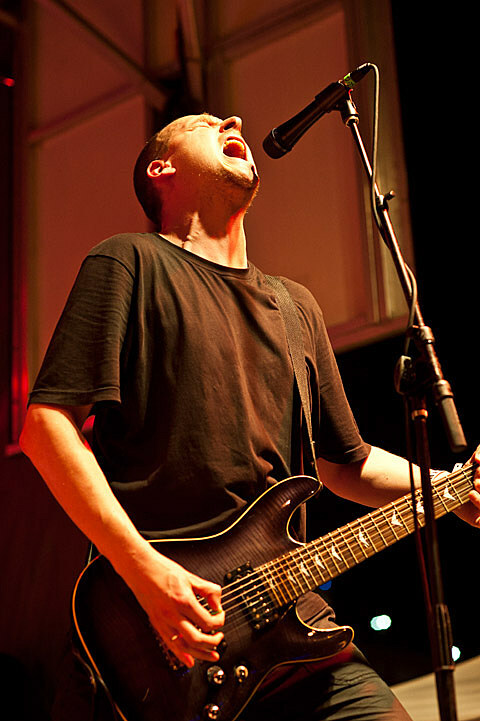 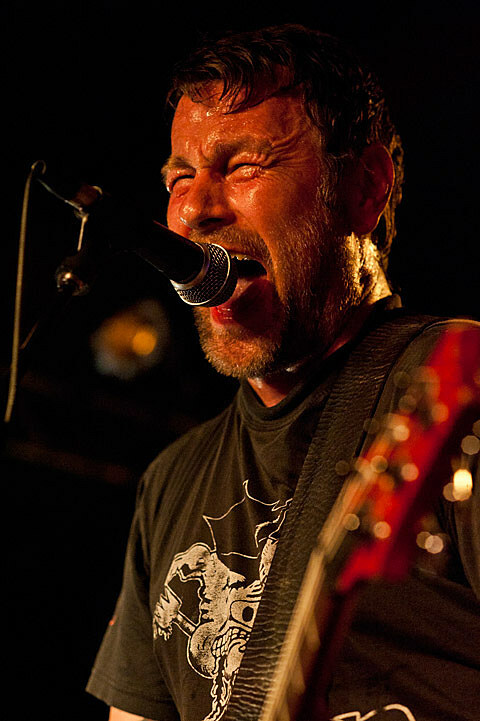 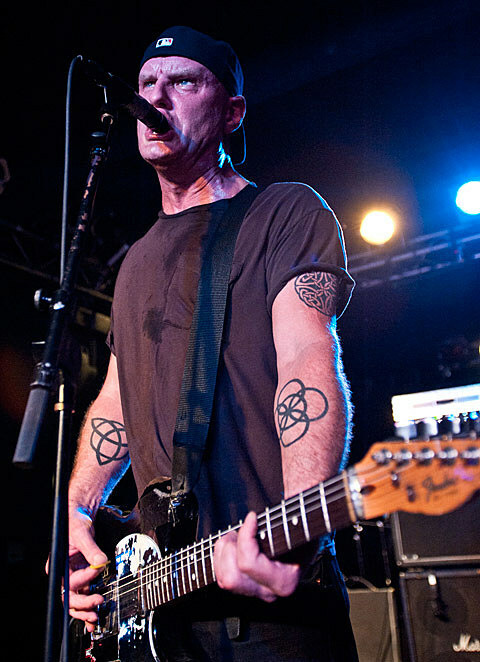 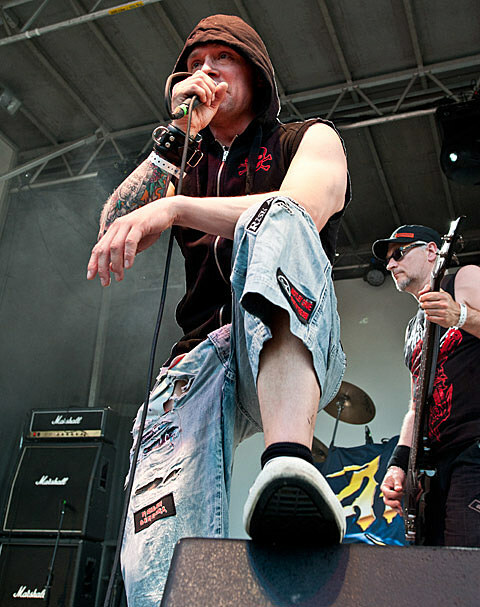 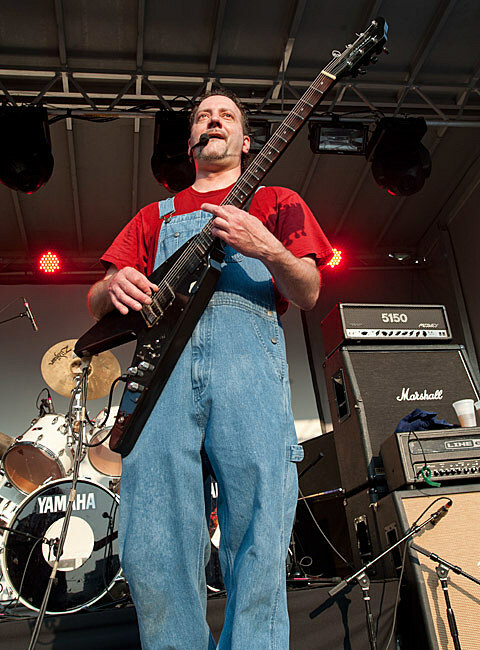 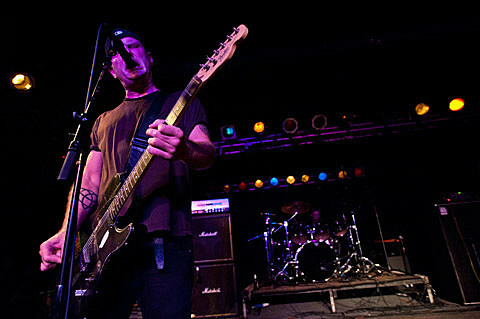 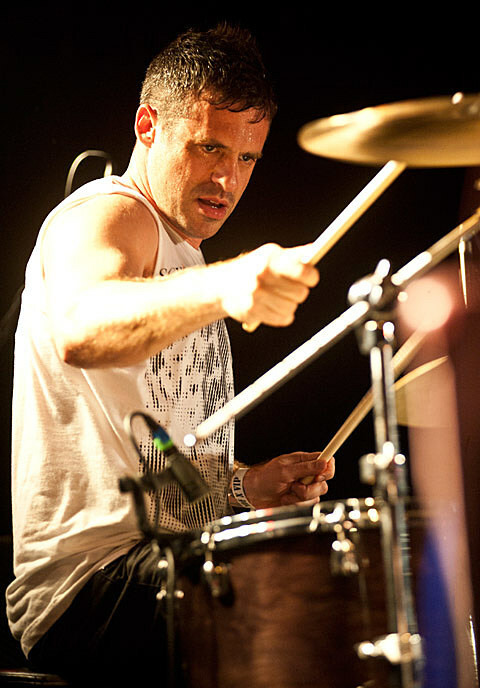 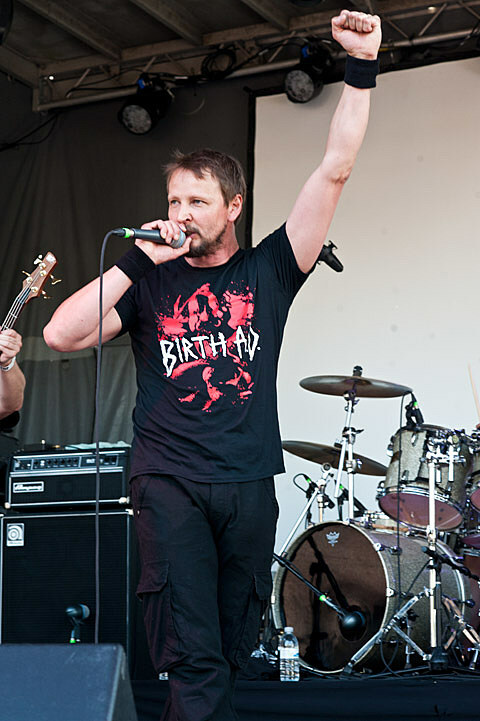 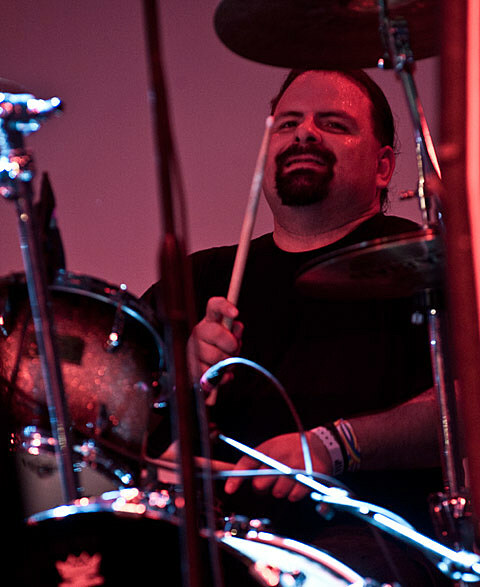 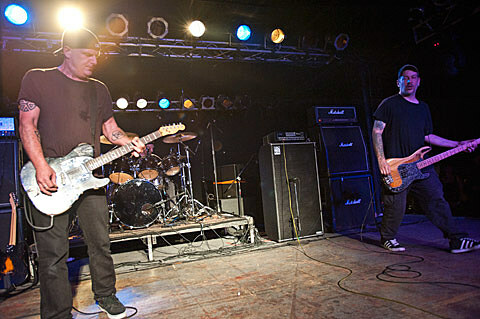 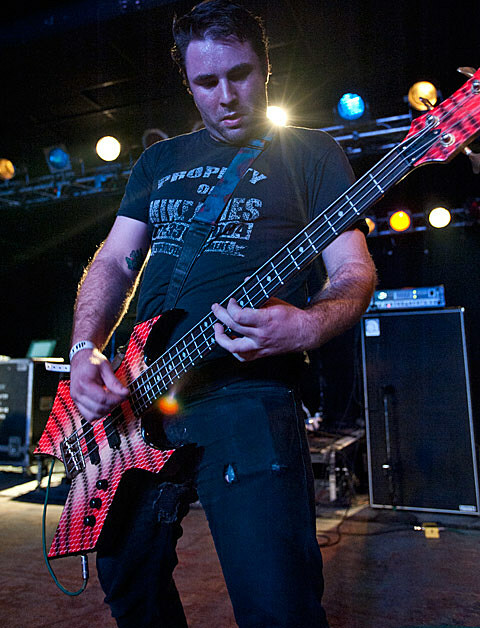 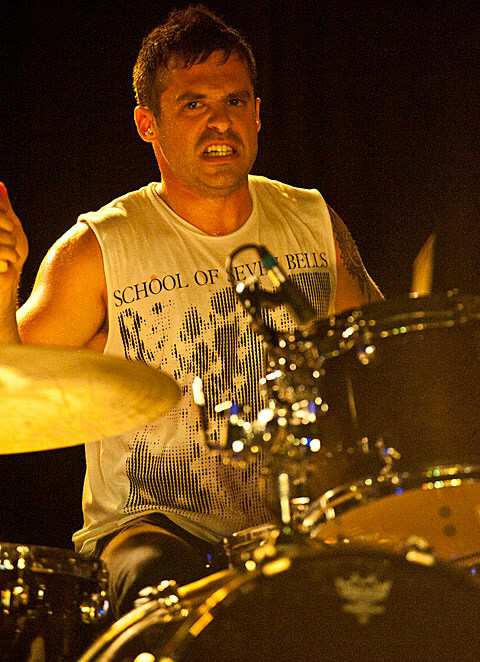 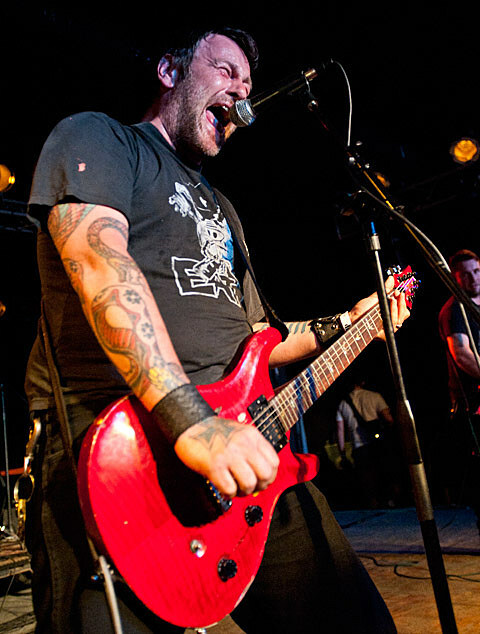 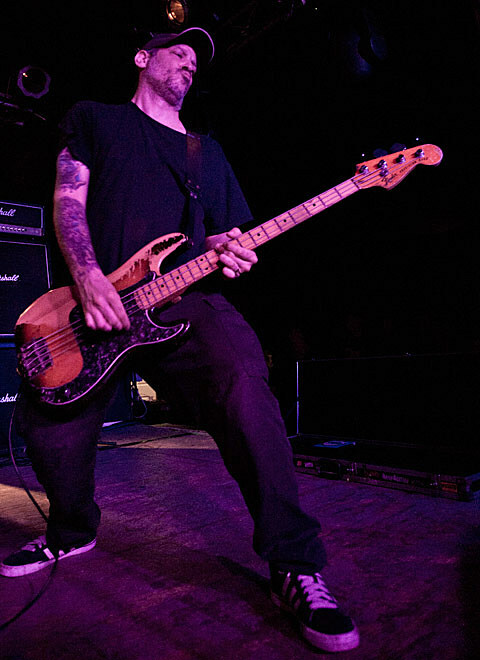 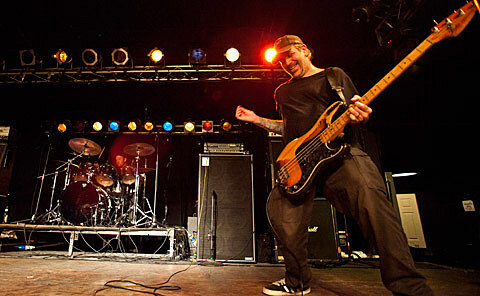 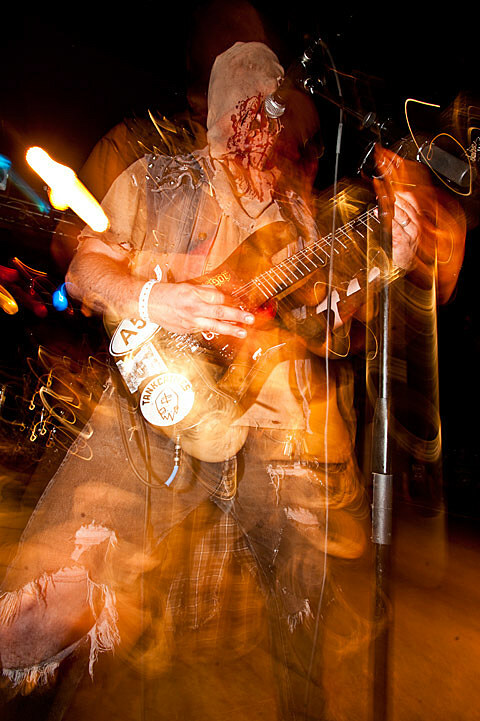 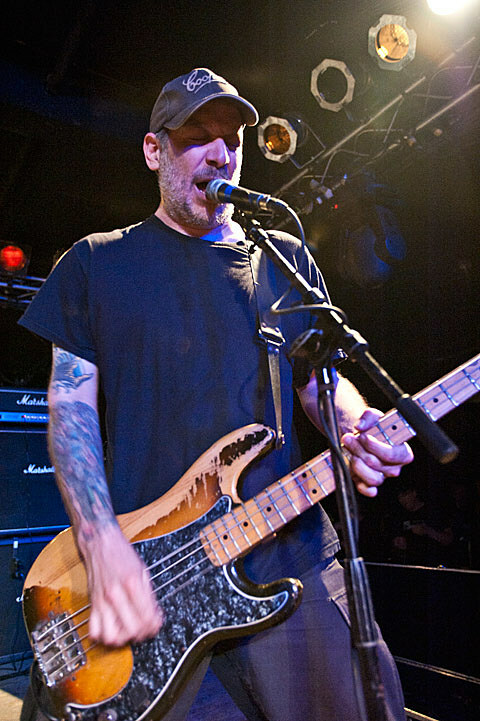 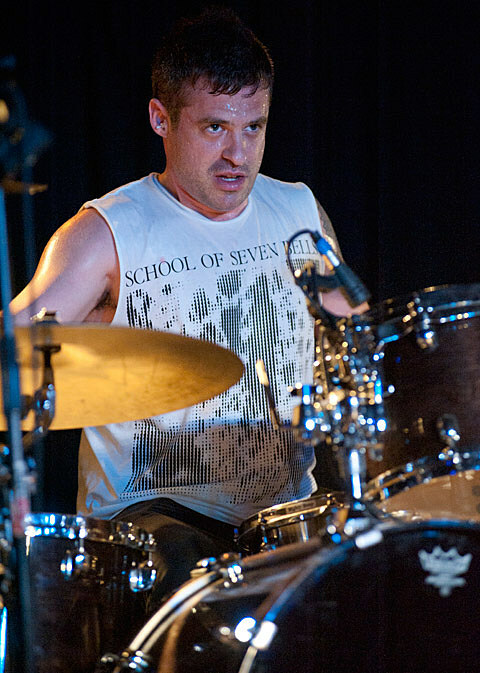 Their former labelmates on Amphetamine Reptile, Unsane, would also kill it later that evening. 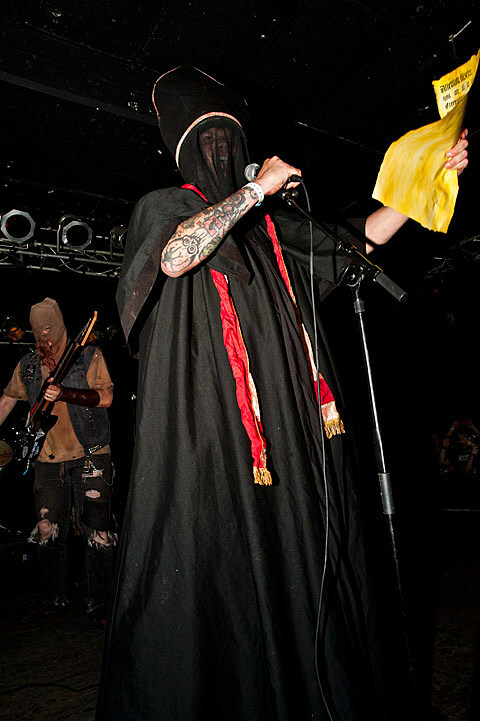 Negura Bunget, or what left of them, followed on the indoor stage (the bulk of the original band was recently replaced), and seemed oddly placed and limp following Today is The Day. 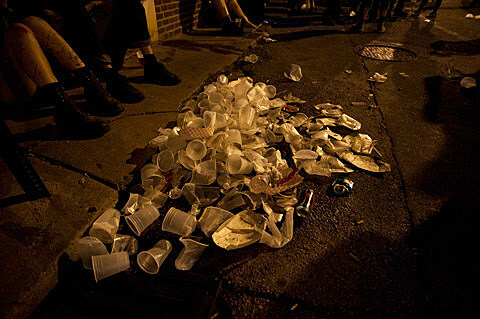 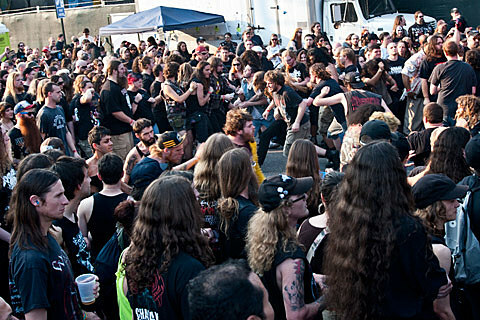 Meanwhile, thrashers Artillery riled up the thrashers on the outside stage but didnt do much for me. 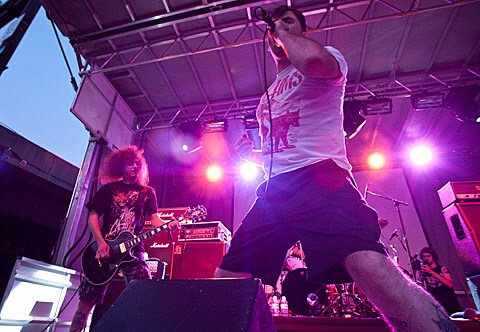 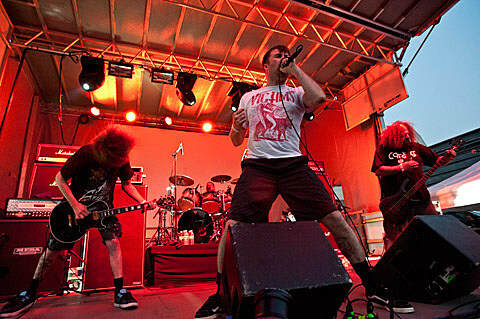 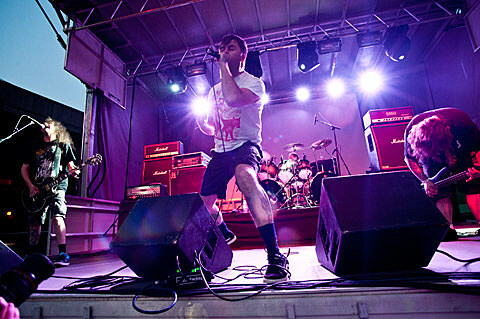 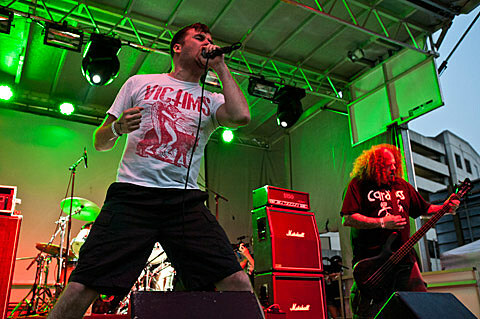 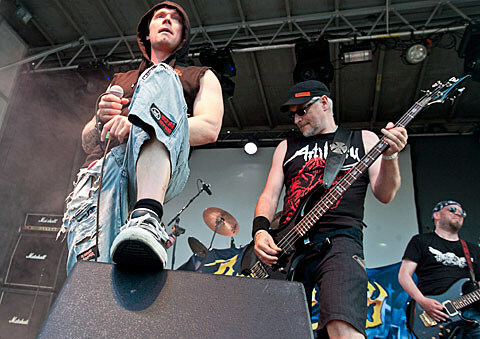 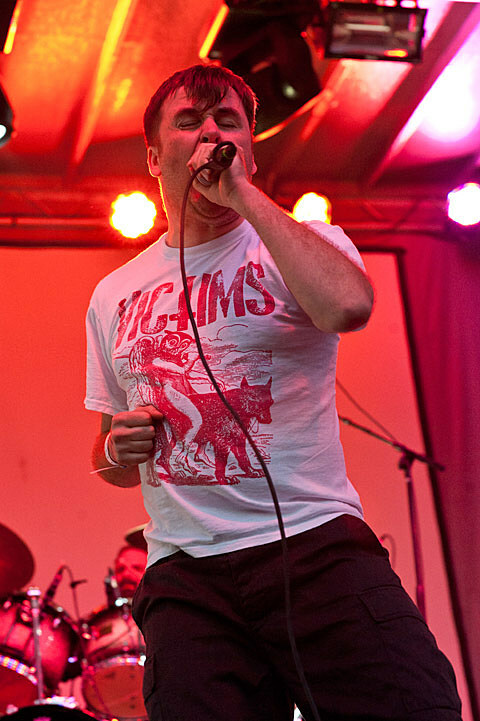 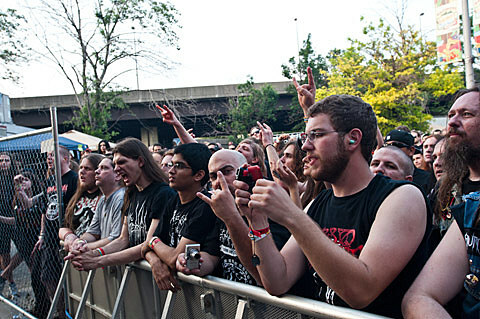 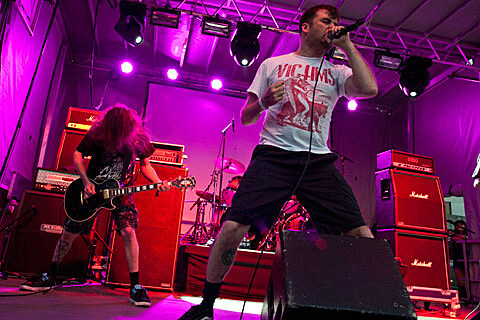 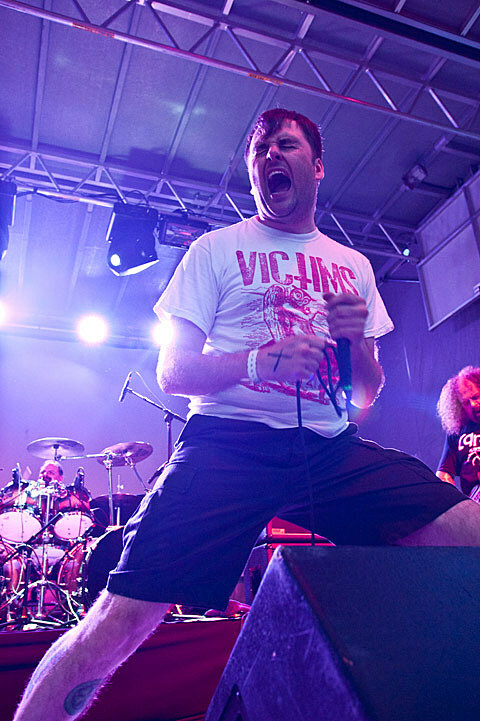 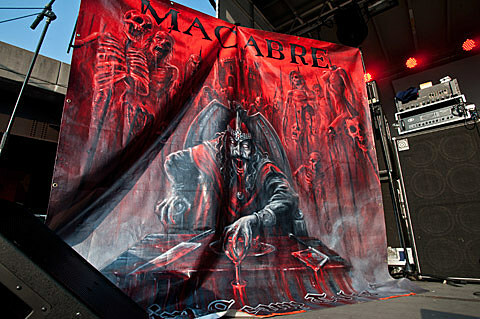 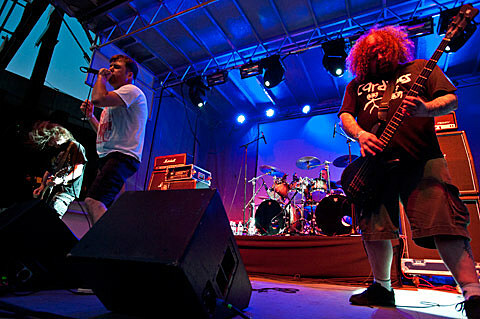 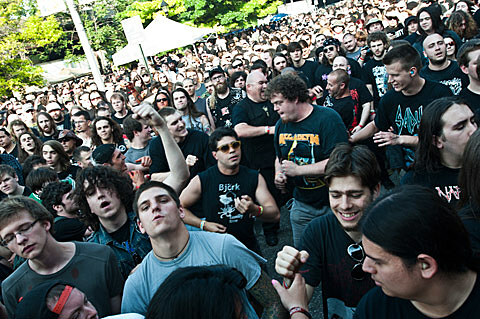 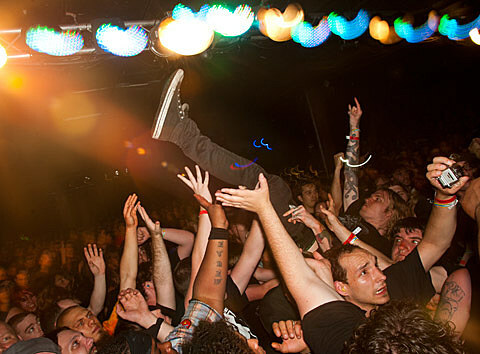 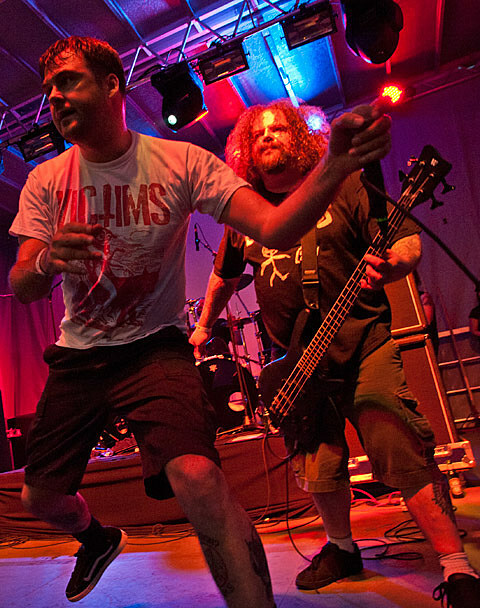 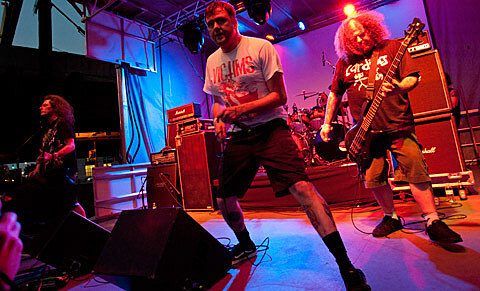 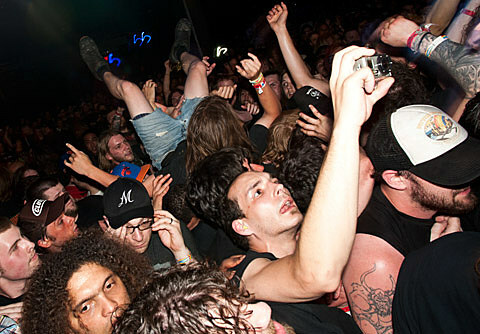 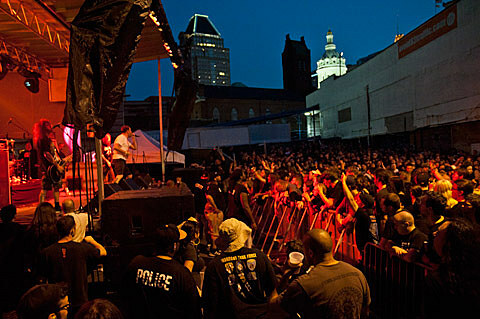 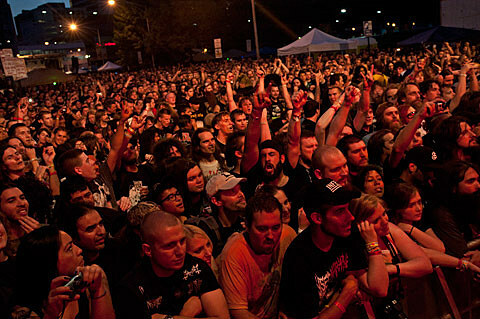 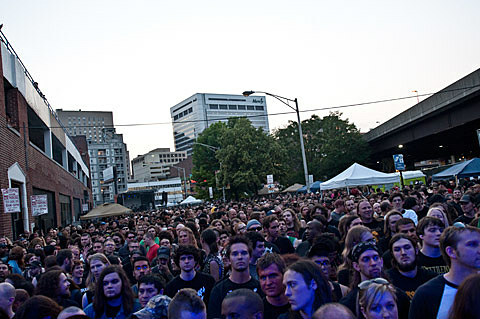 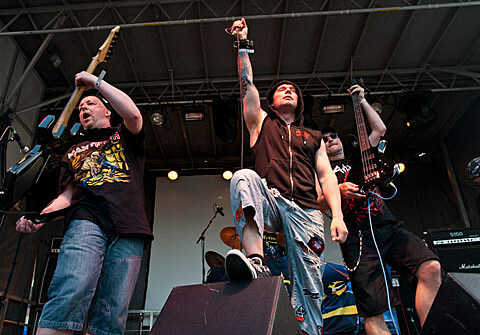 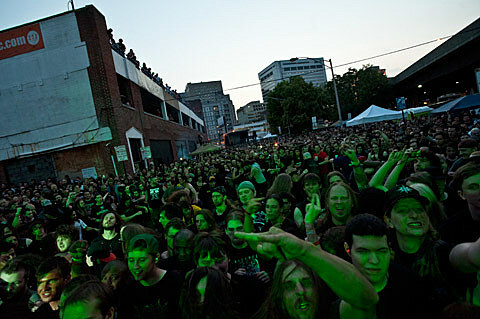 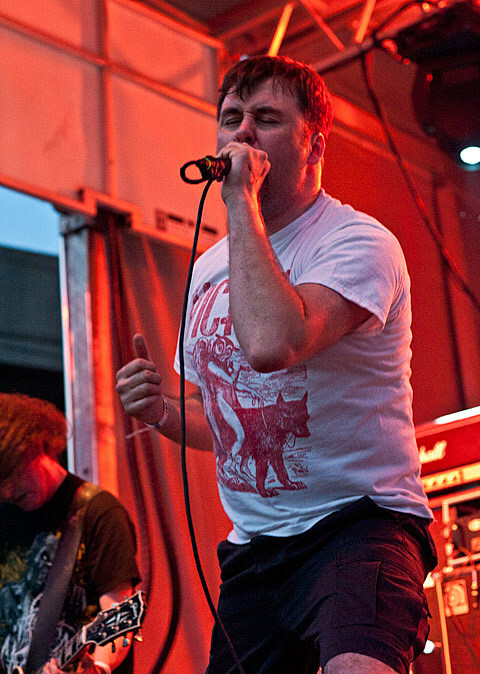 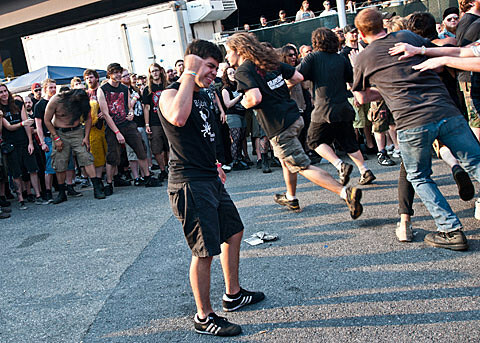 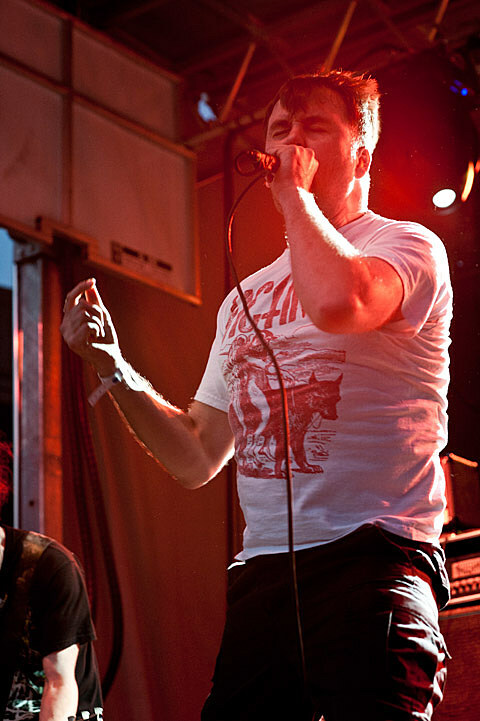 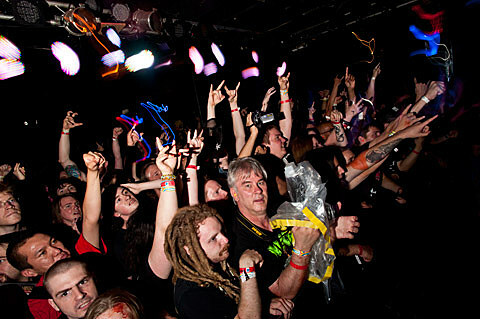 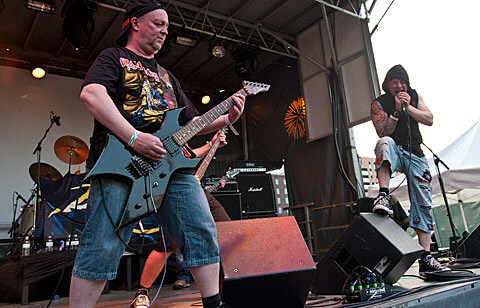 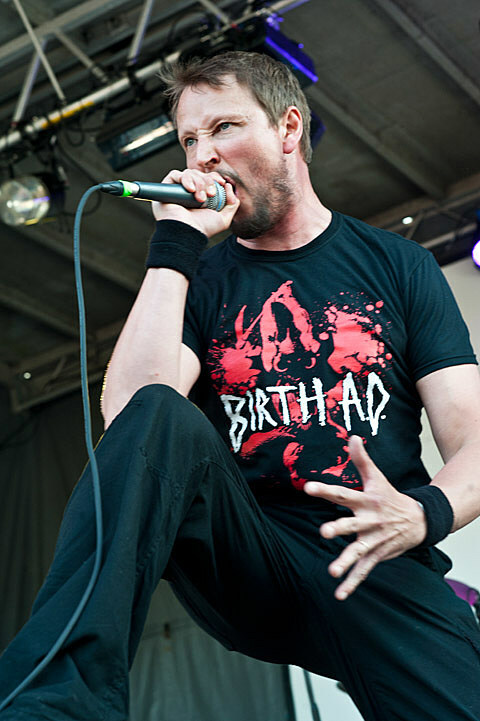 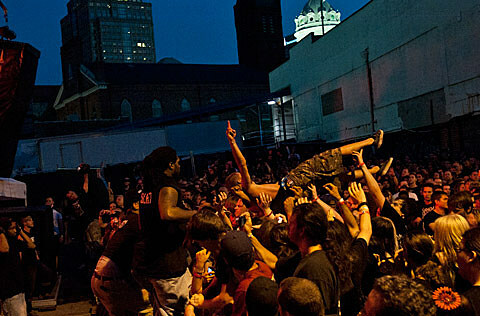 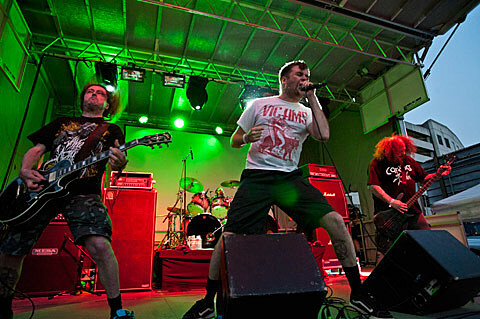 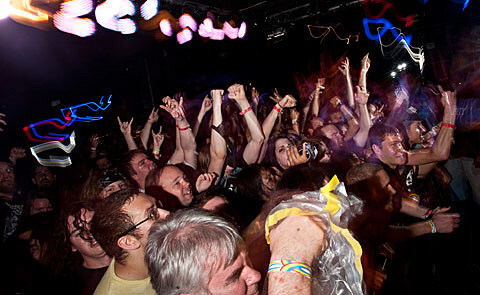 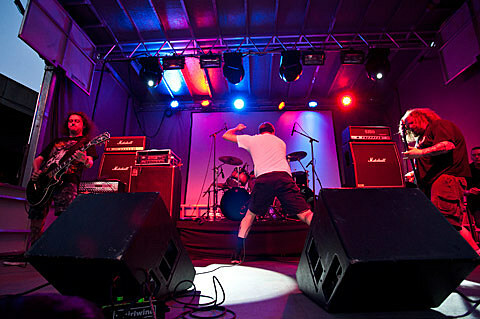 Napalm Death headlined the first of the two outdoor stages, playing material from each of their prior albums to a circle-pitting, crowd-surfing audience. 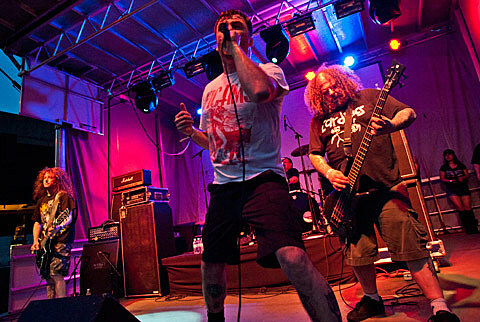 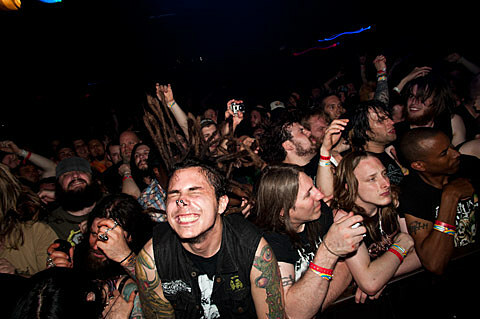 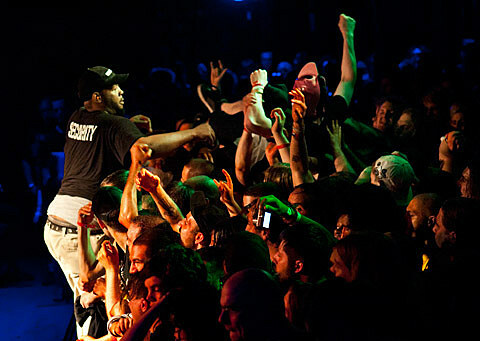 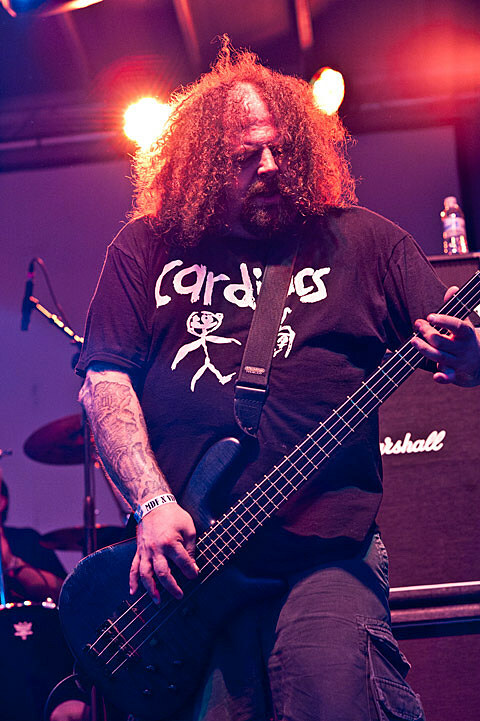 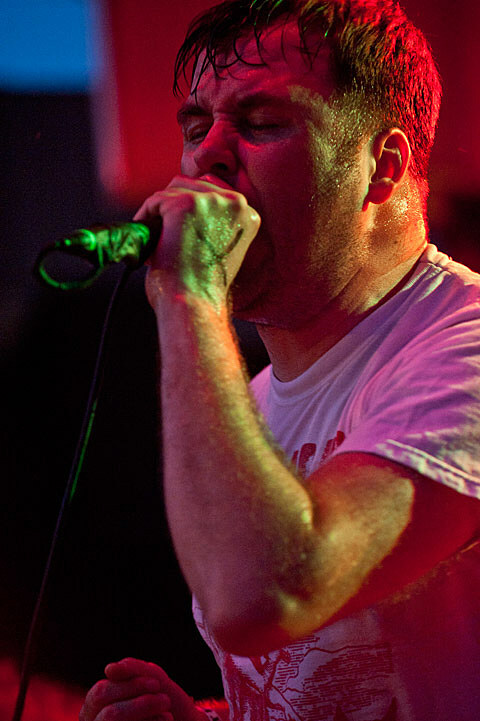 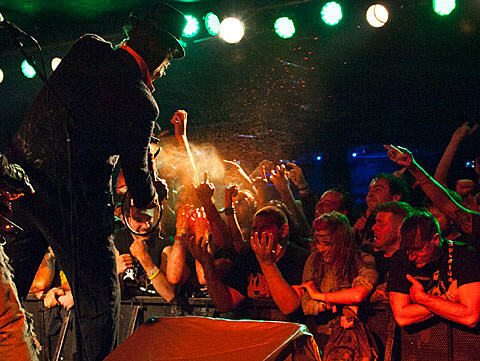 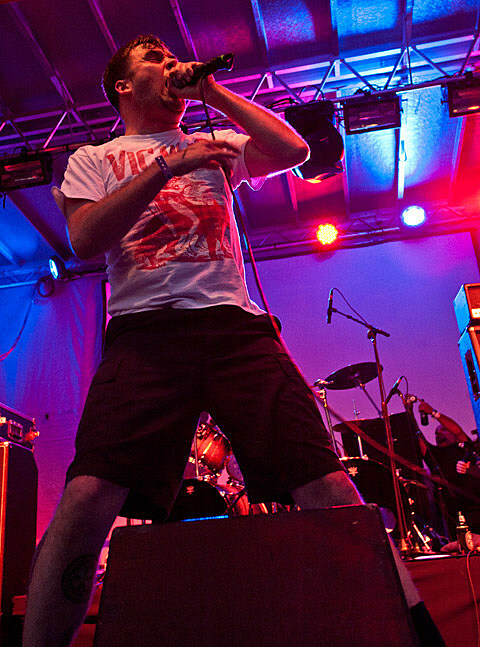 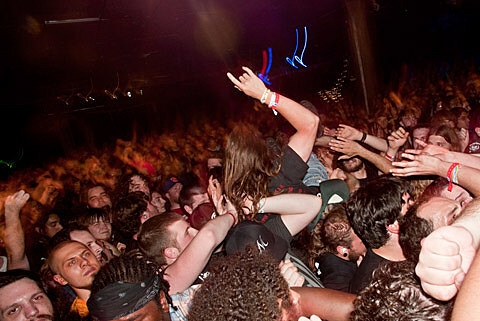 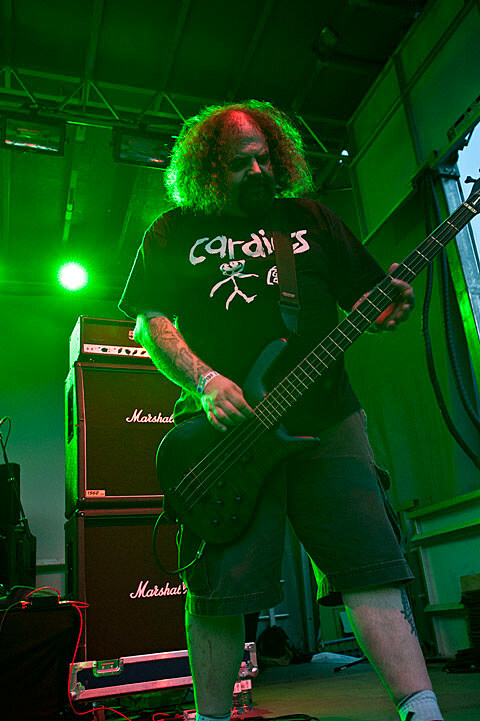 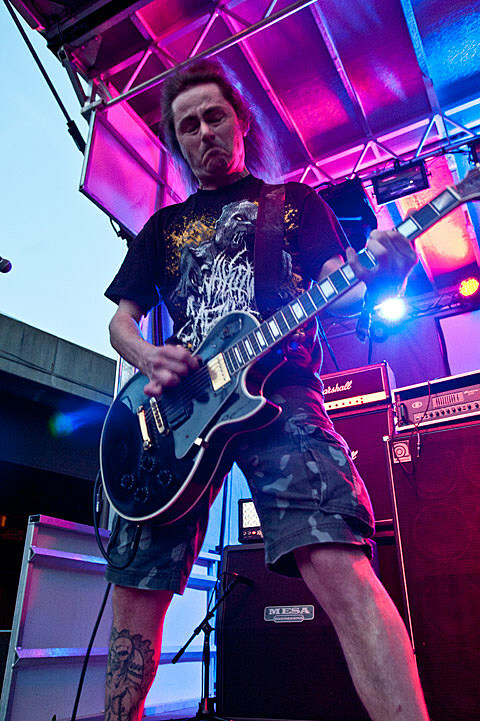 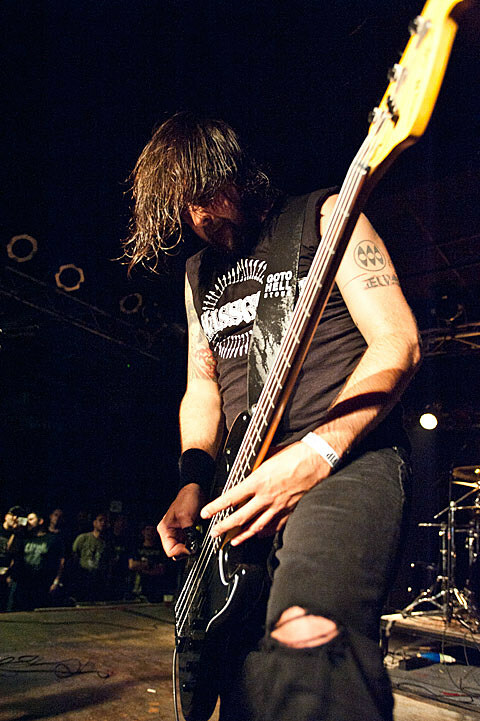 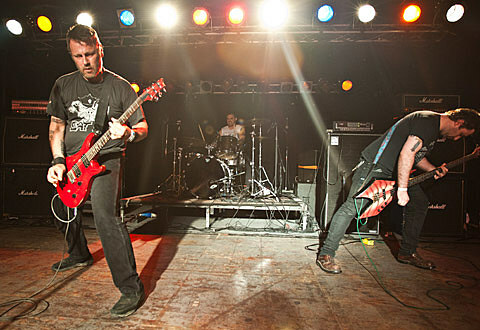 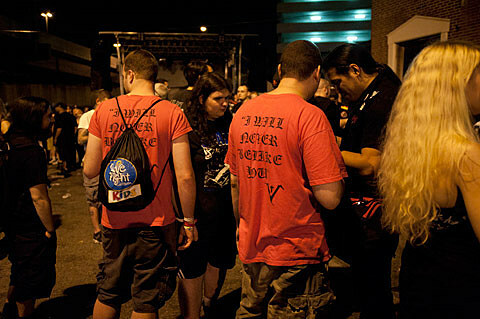 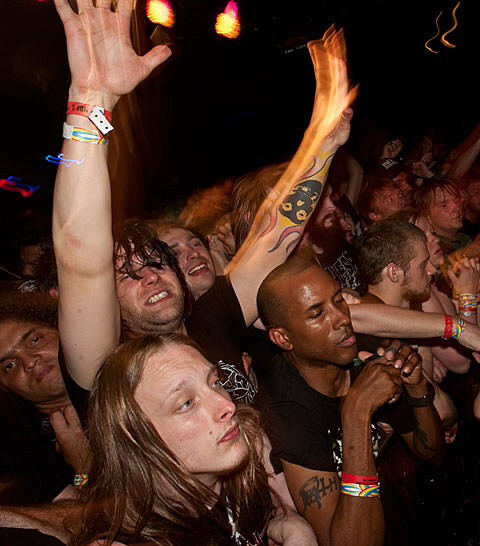 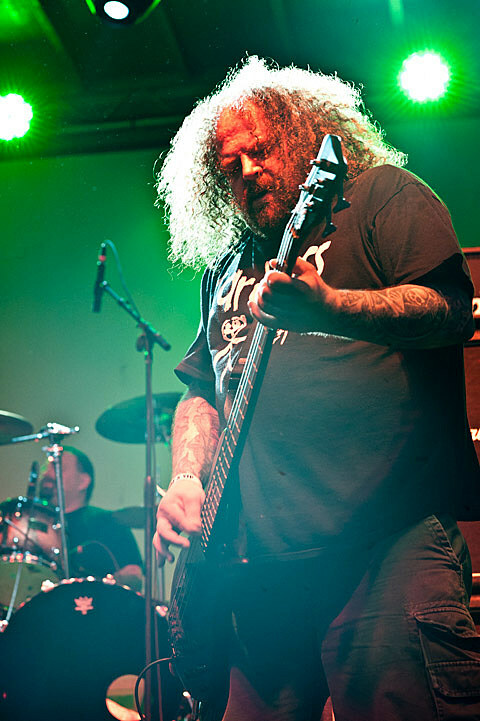 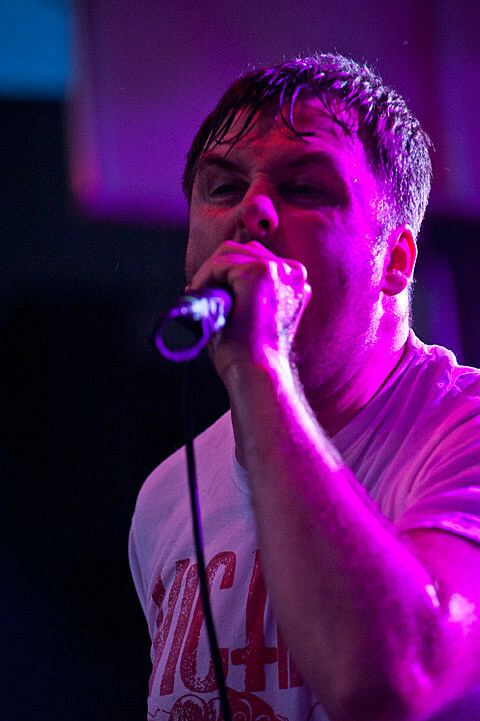 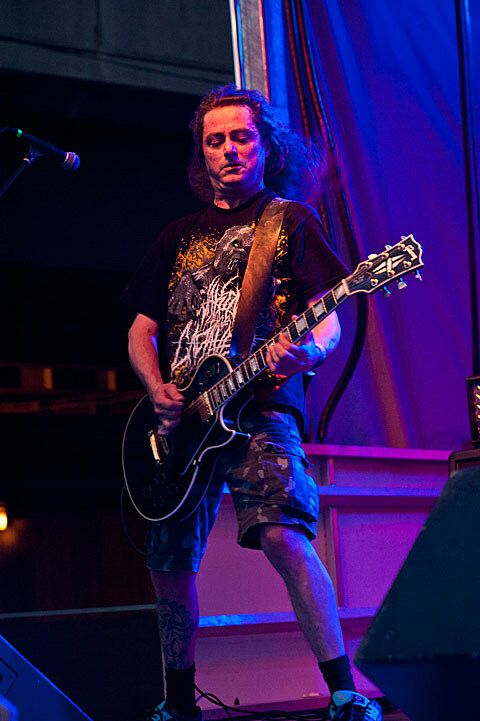 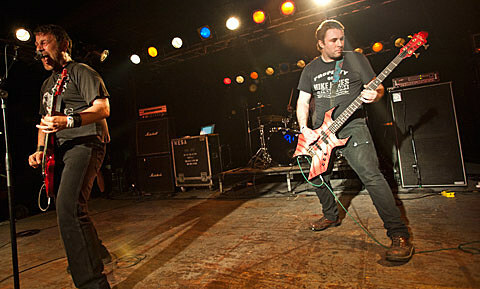 Besides being the originators of the genre, Napalm Death is also one of grind’s tightest live crews; the term legend is more than well-deserved. 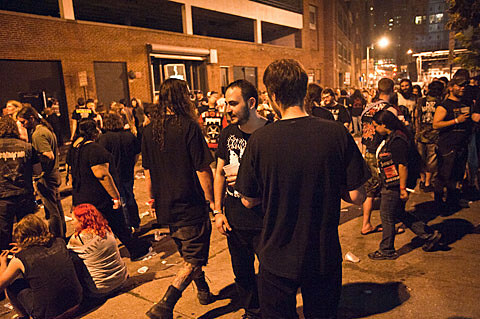 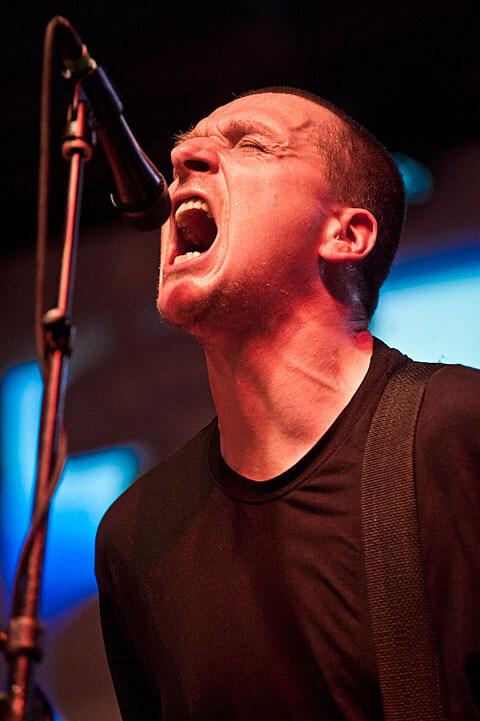 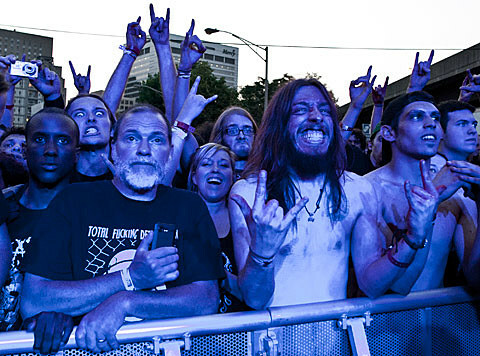 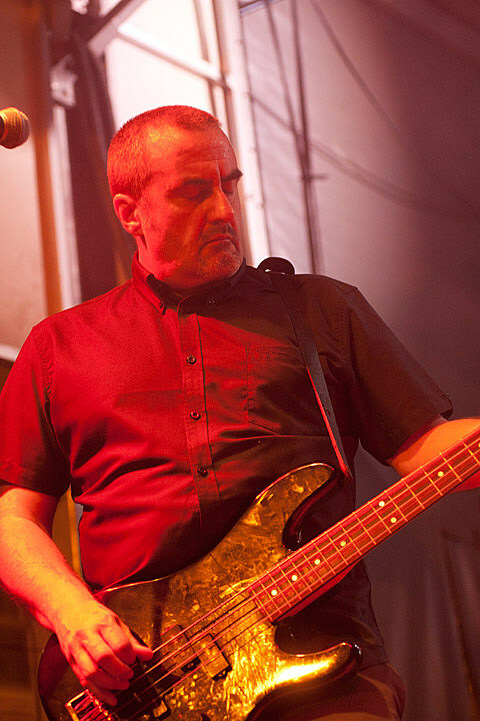 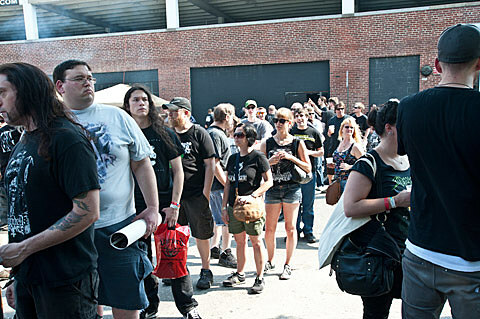 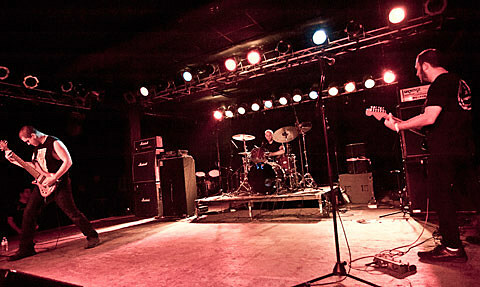 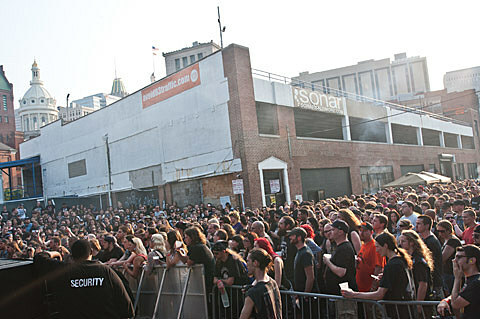 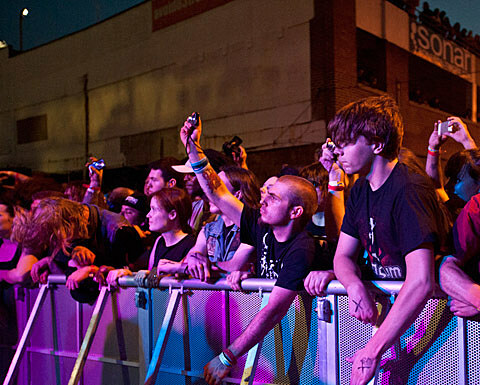 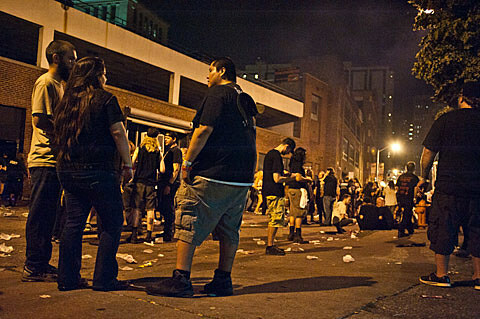 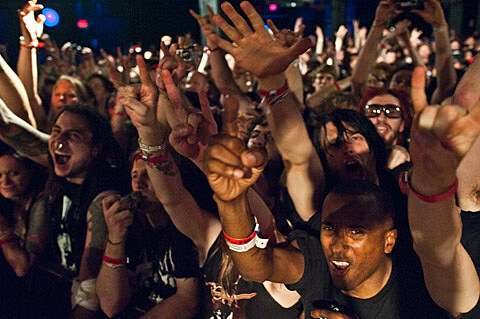 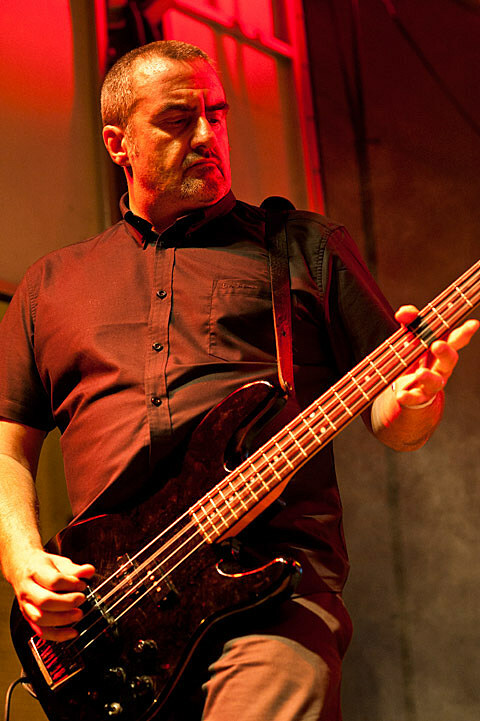 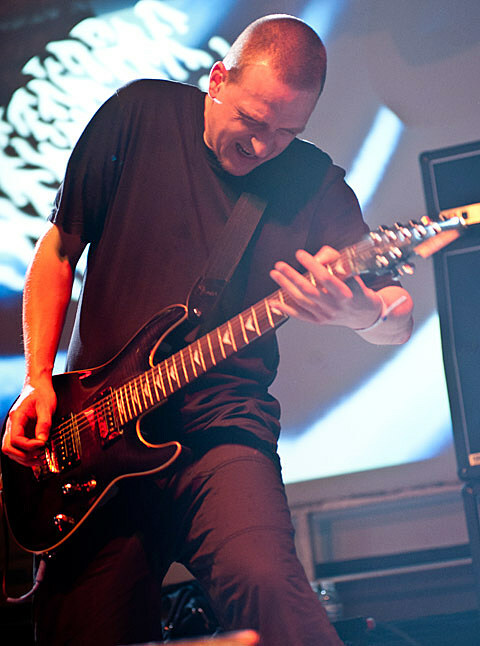 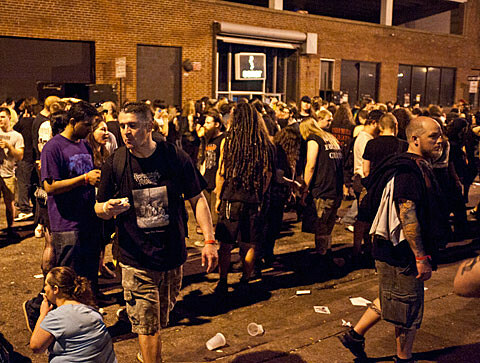 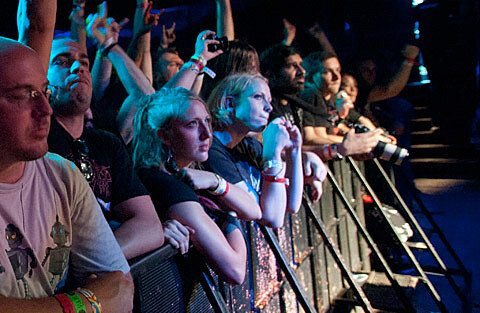 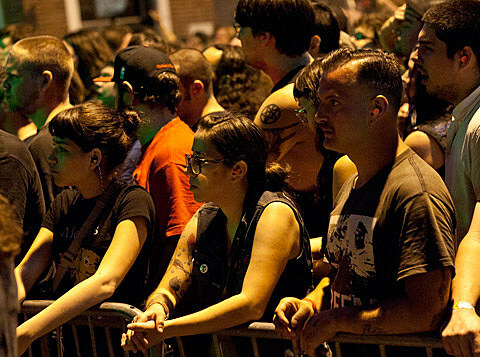 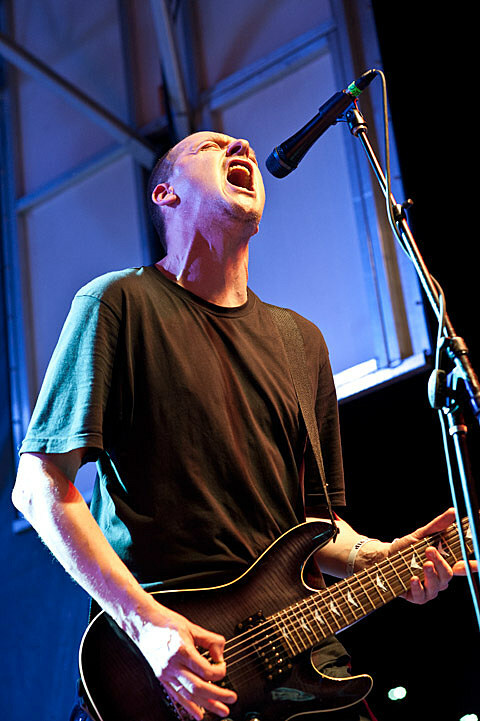 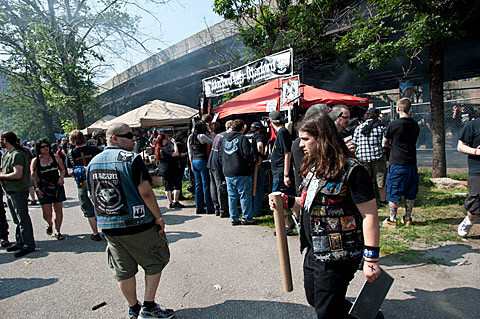 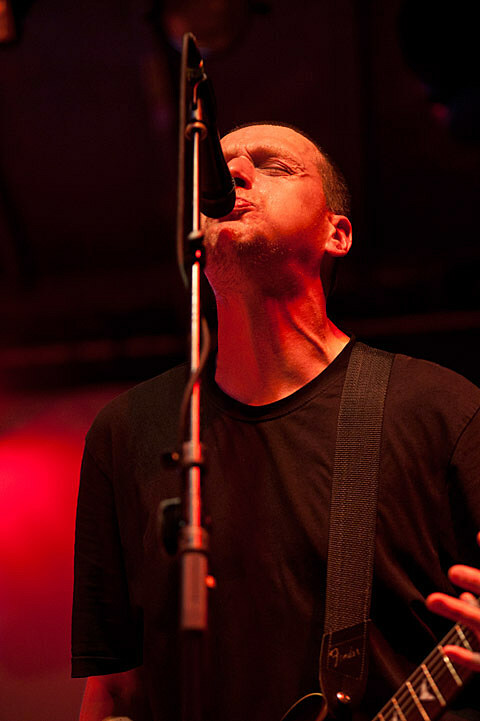 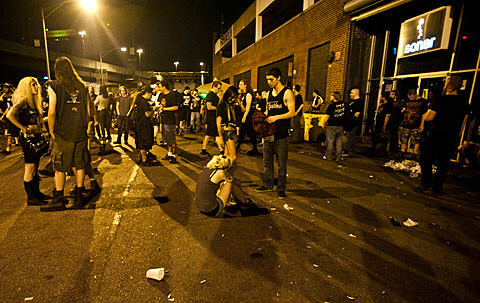 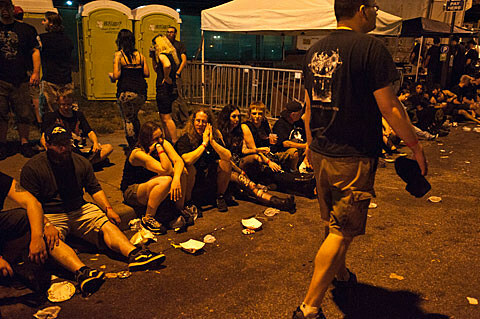 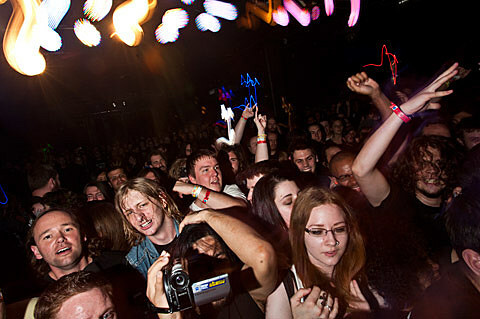 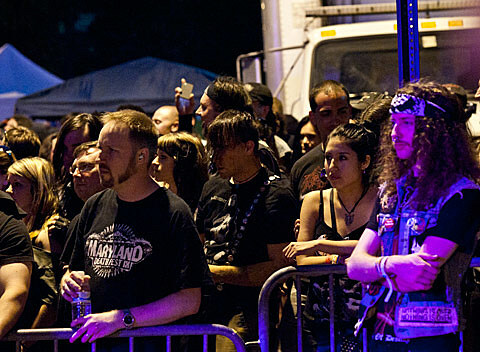 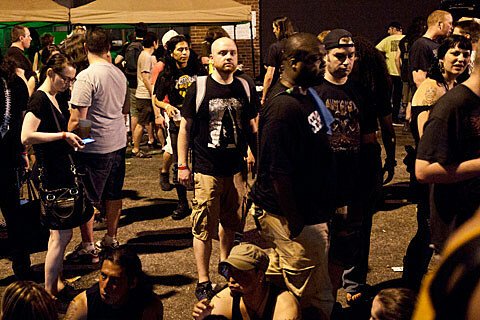 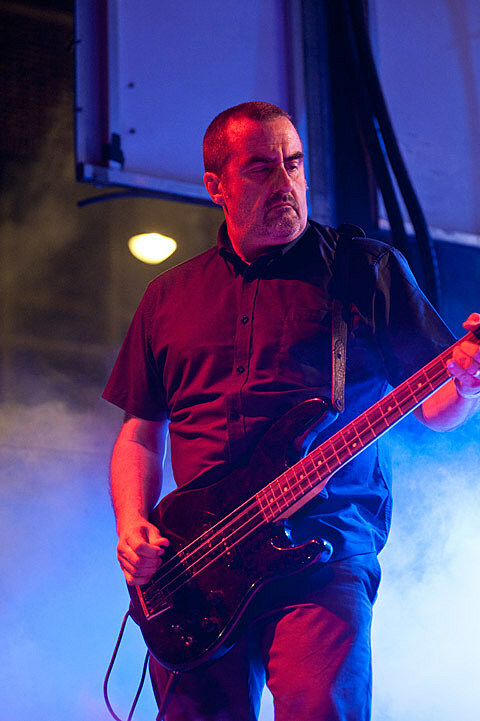 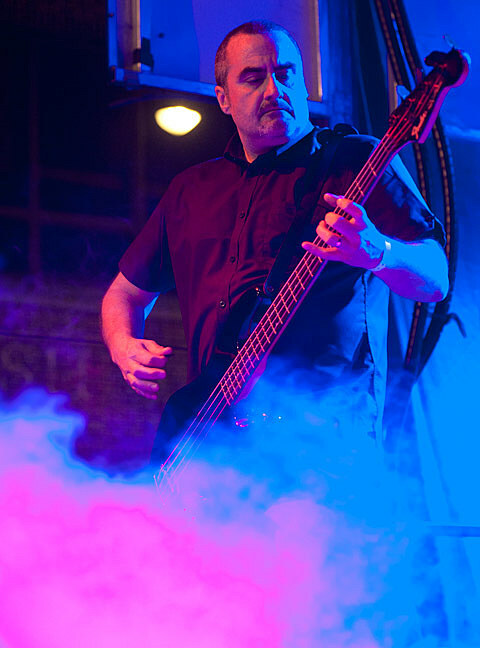 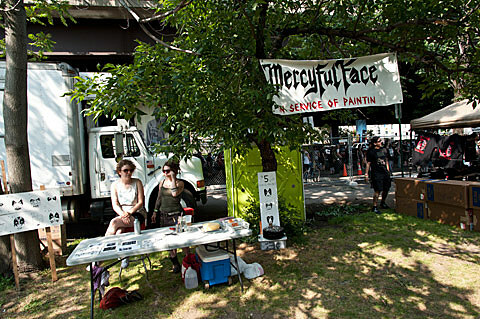 The crowd had lined up in front of the second stage a long time before Godflesh ripped into their first chord, so from the moment that the band kicked into “Like Rats” the pits and surfers had easily migrated to the other end of the parking lot. 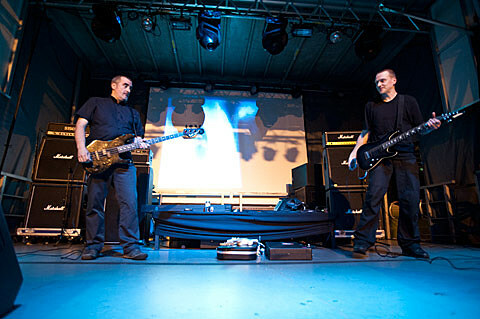 The duo (and requisite drum machine) played material from their legendary Streetcleaner and though they slightly overstayed their welcome, it was nonethless amazing to see them live. 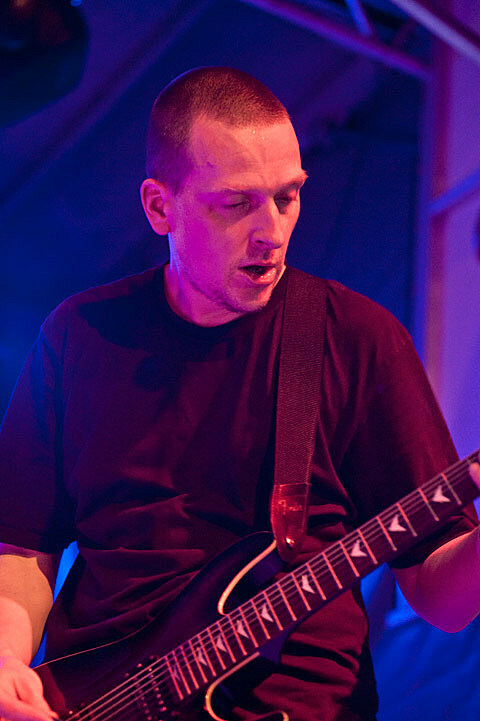 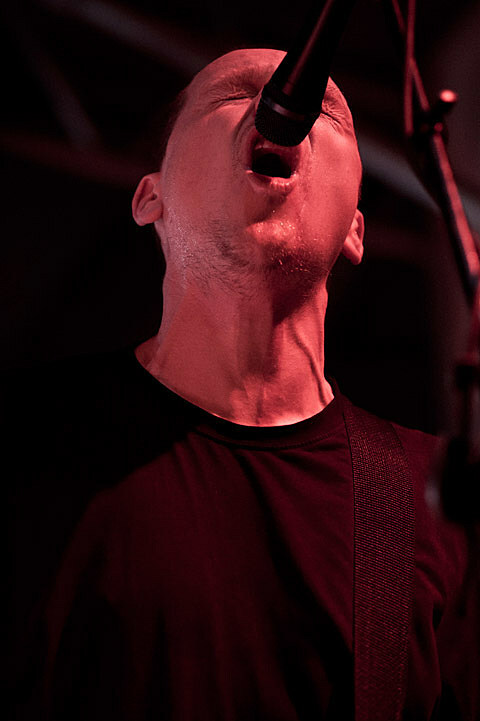 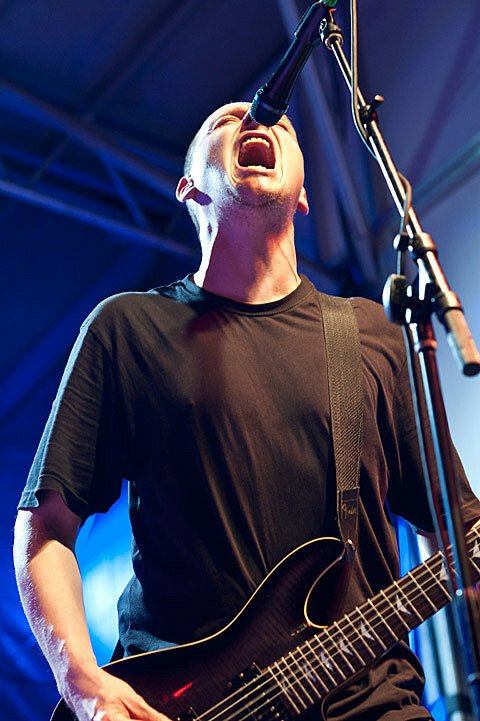 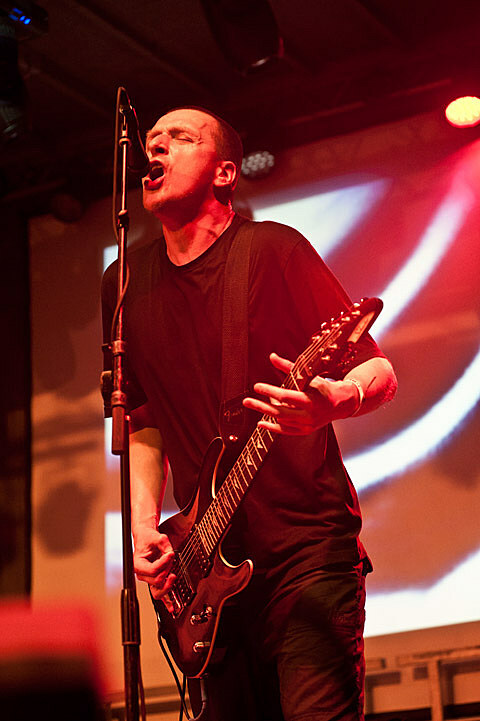 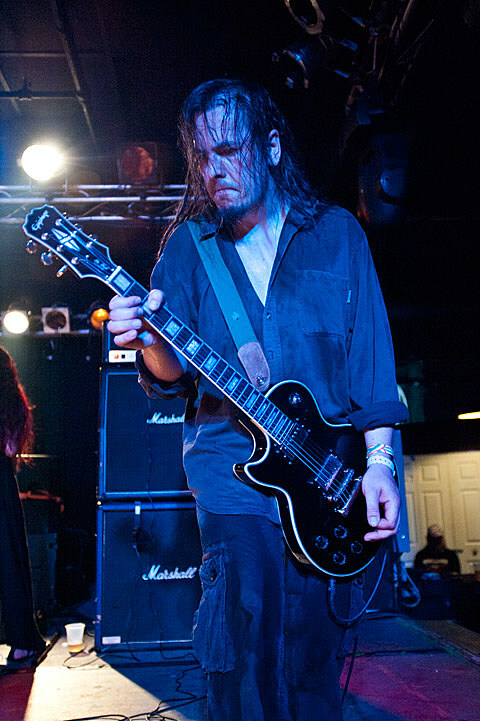 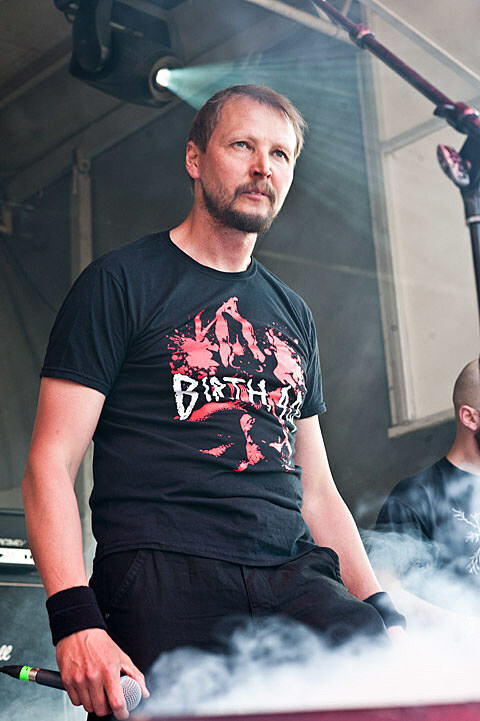 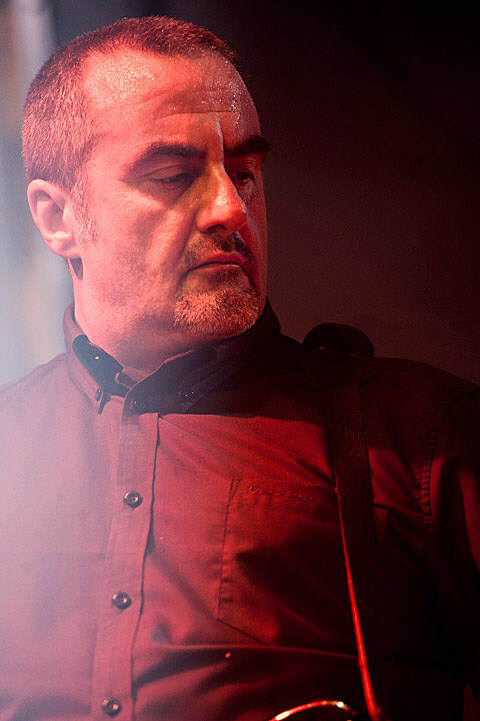 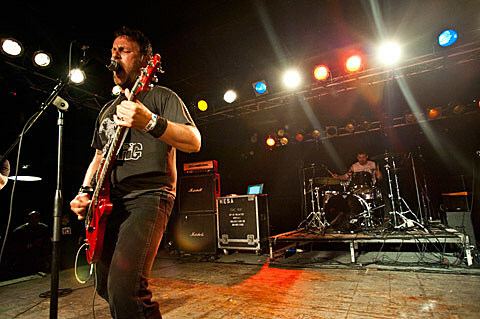 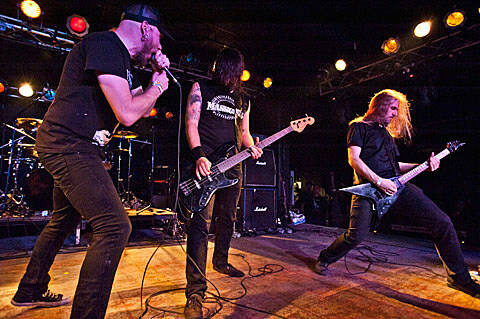 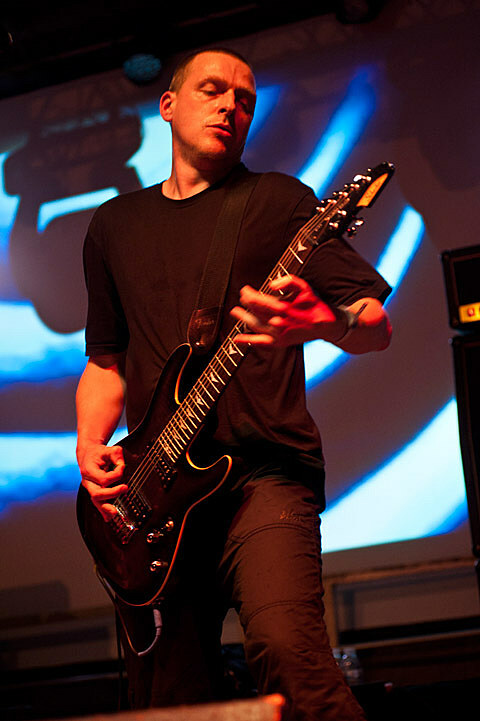 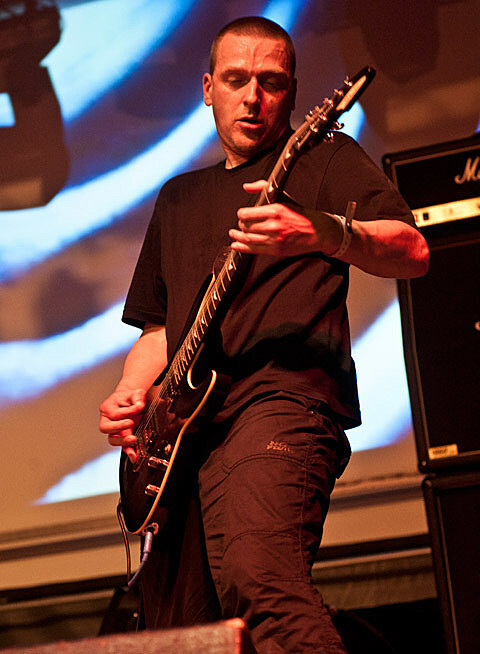 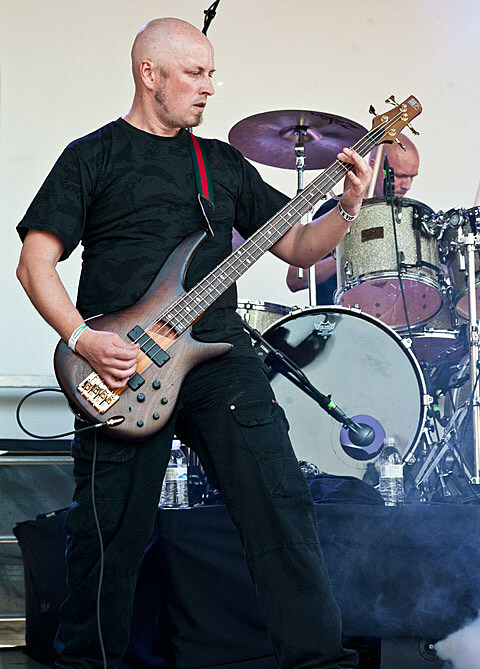 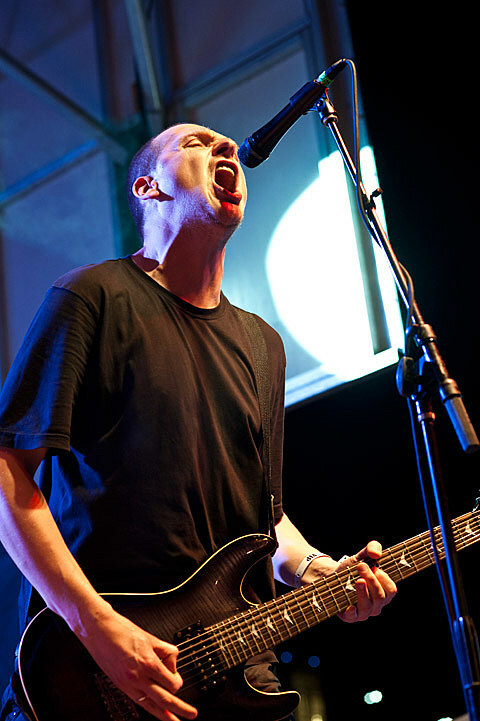 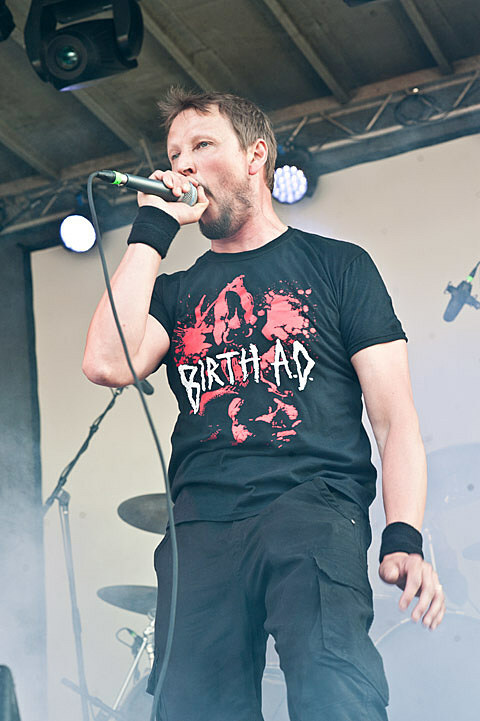 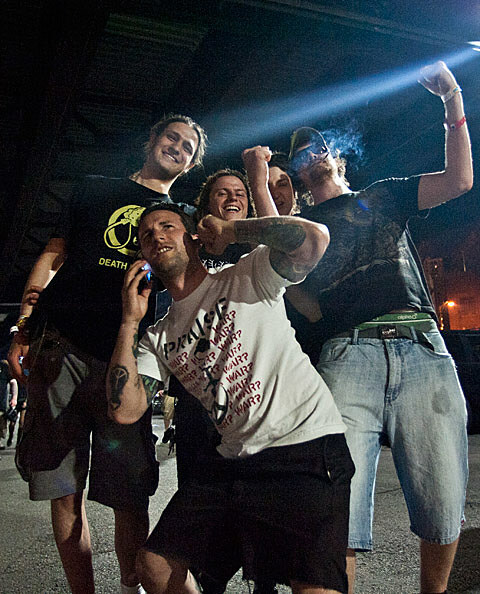 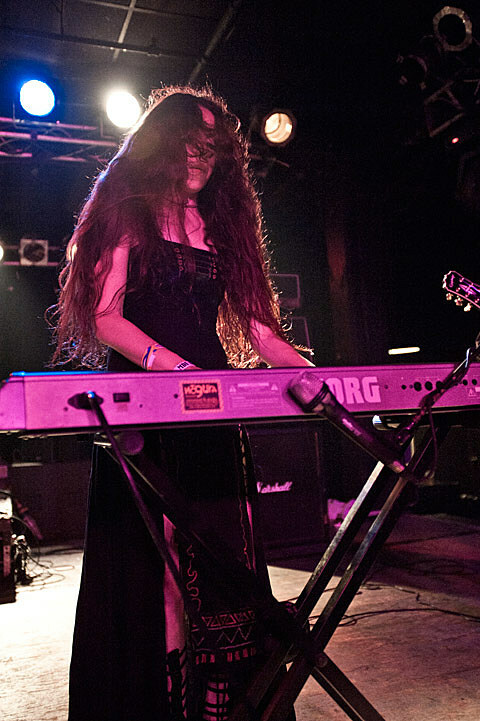 The reactivated Nasum (who we recently interviewed) headlined the indoor stage at Sonar and similar to the Godflesh and Napalm Death, the crowd let loose by the time Rotten Sound’s Keijo Niinimaa belted out the first vocal. 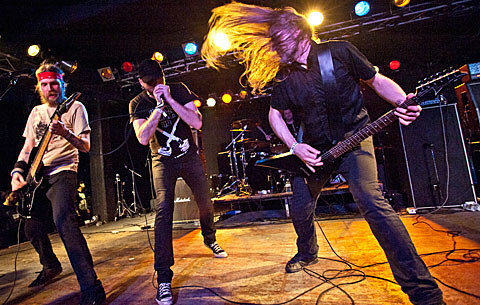 The five piece will be missed, but they definitely went out with a bang. 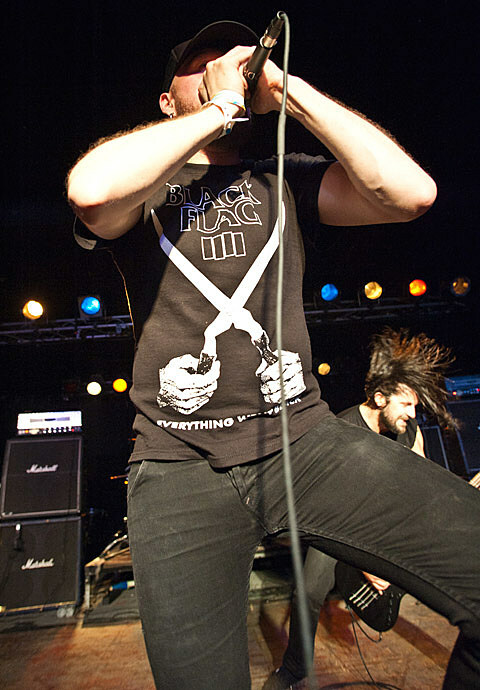 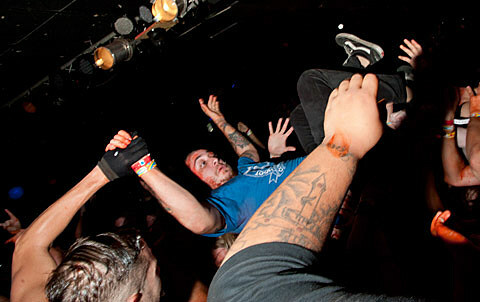 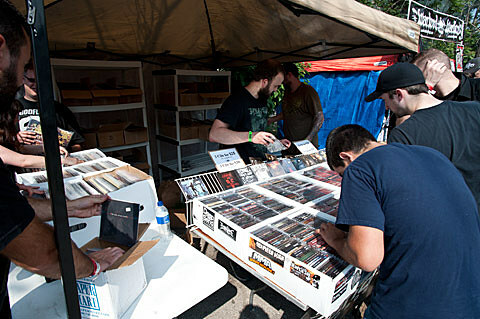 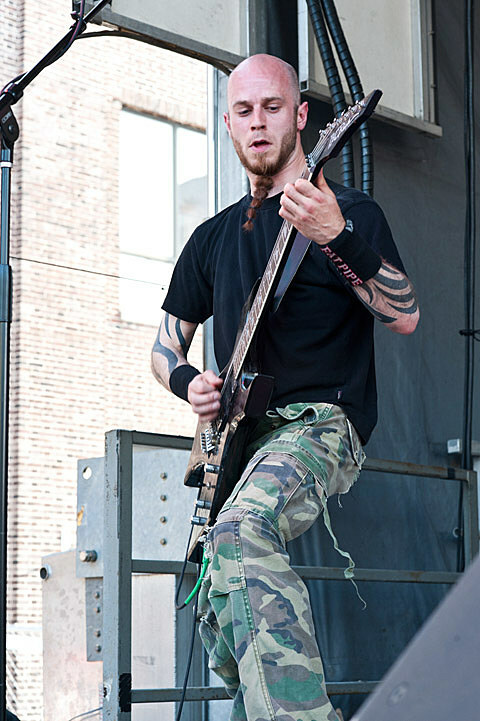 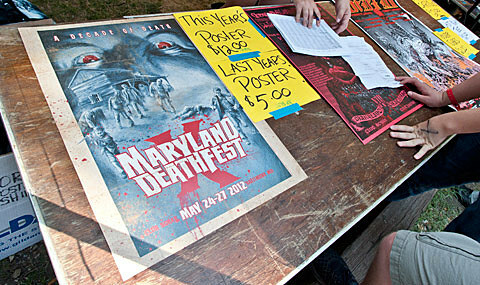 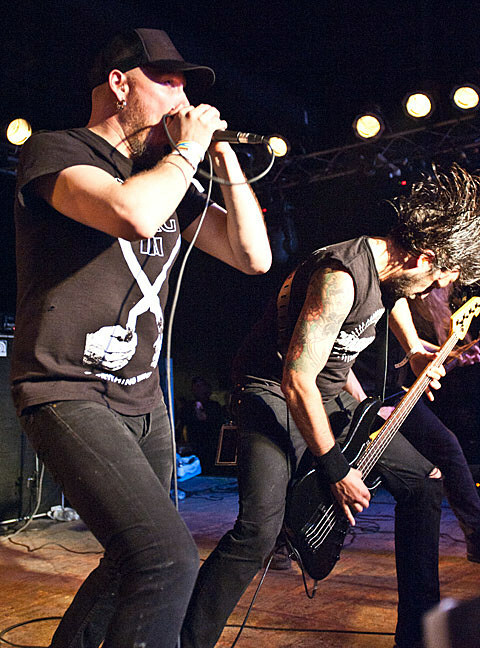 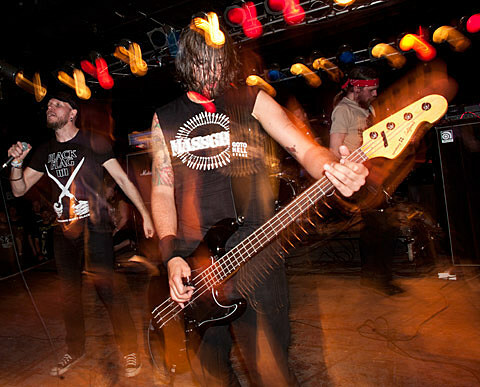 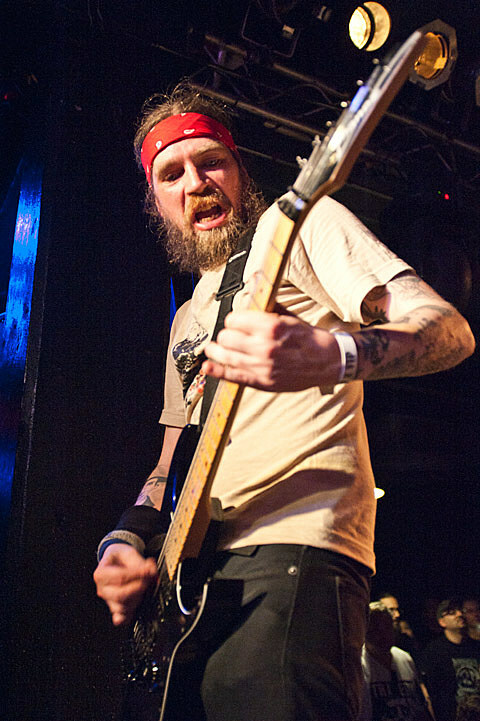 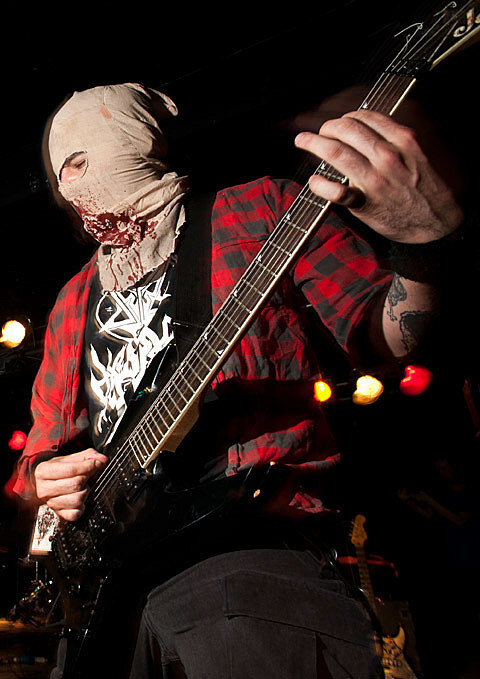 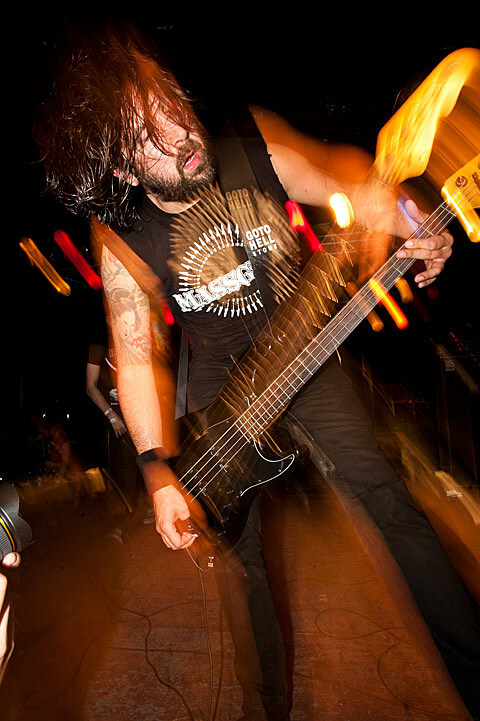 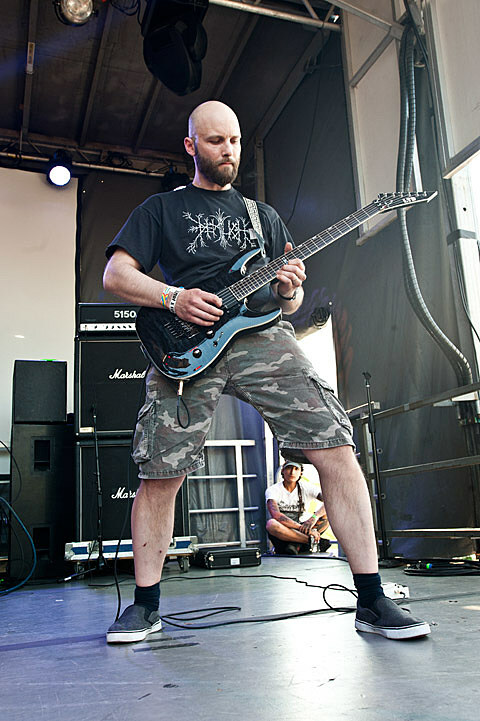 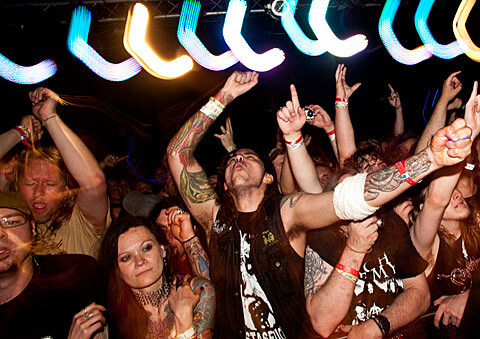 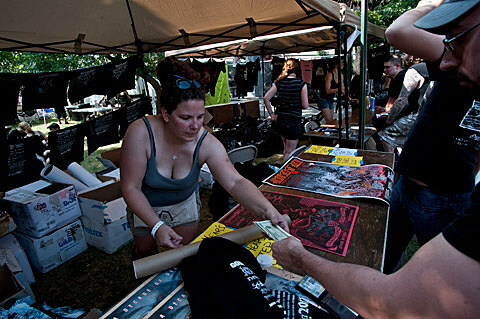 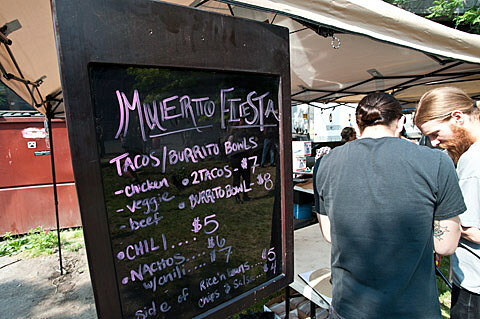 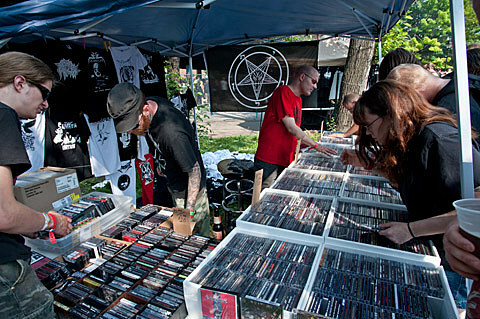 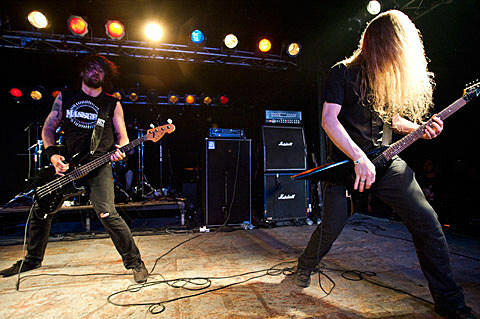 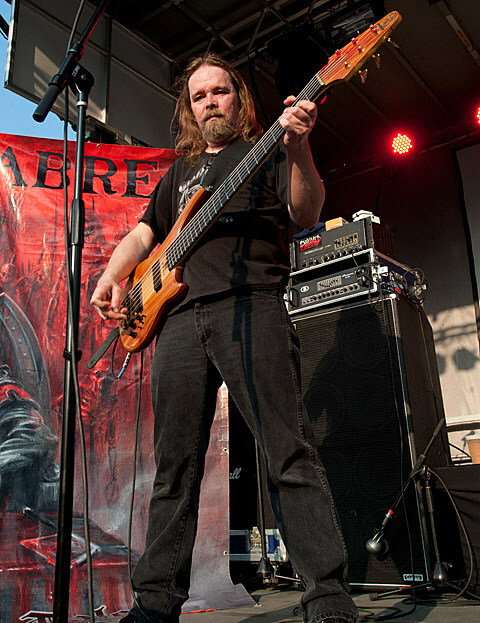 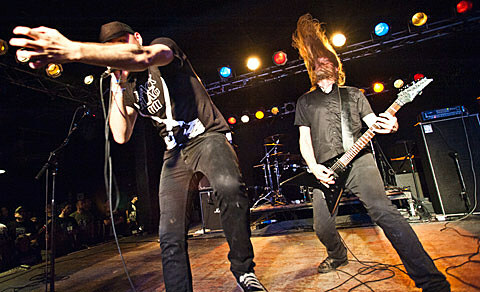 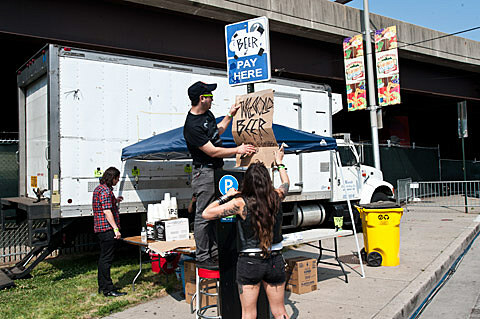 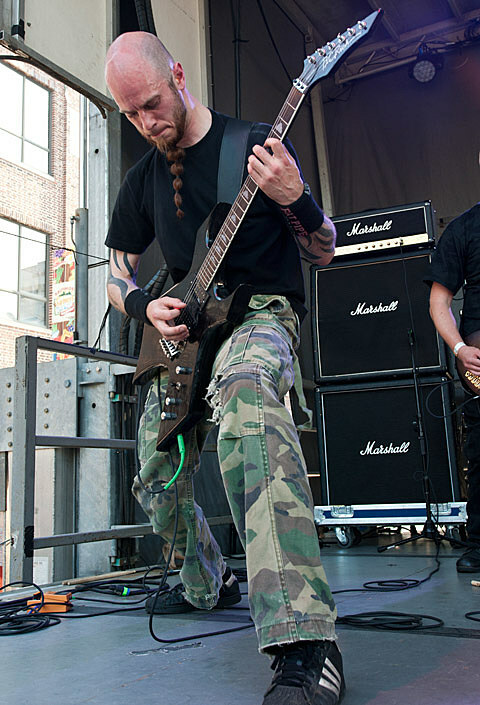 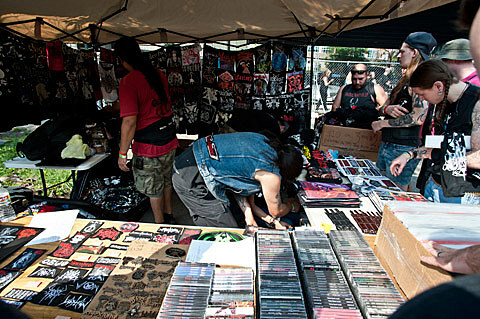 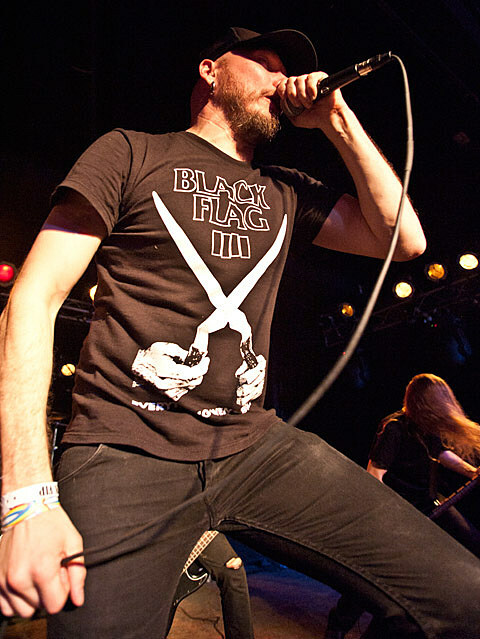 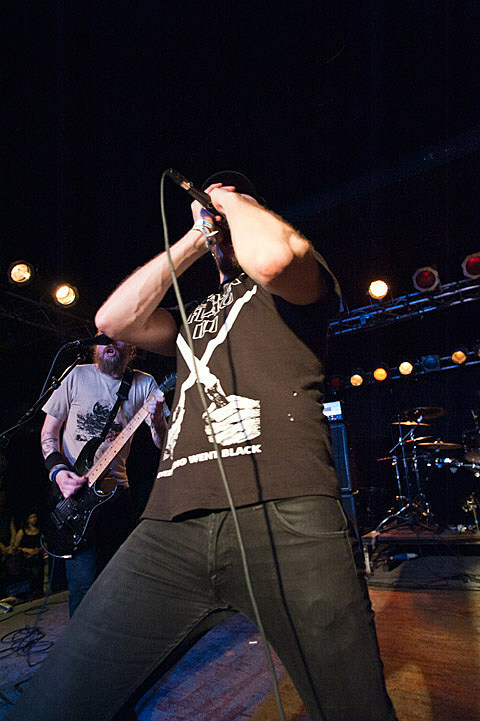 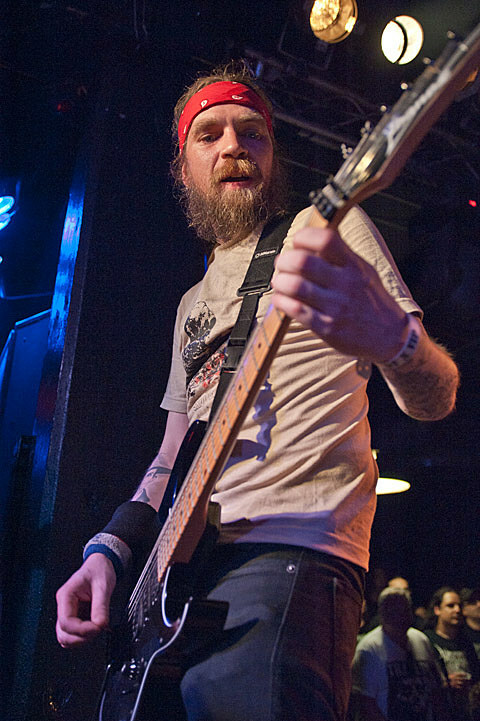 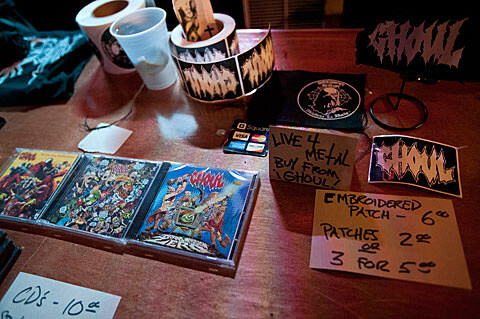 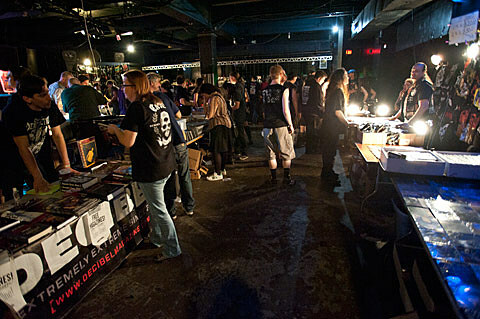 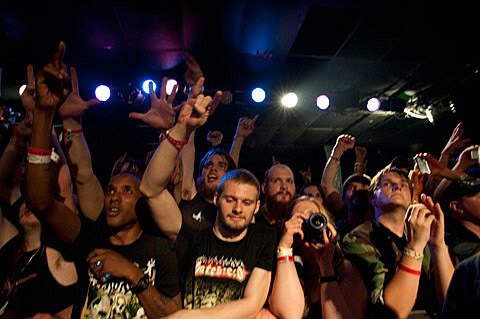 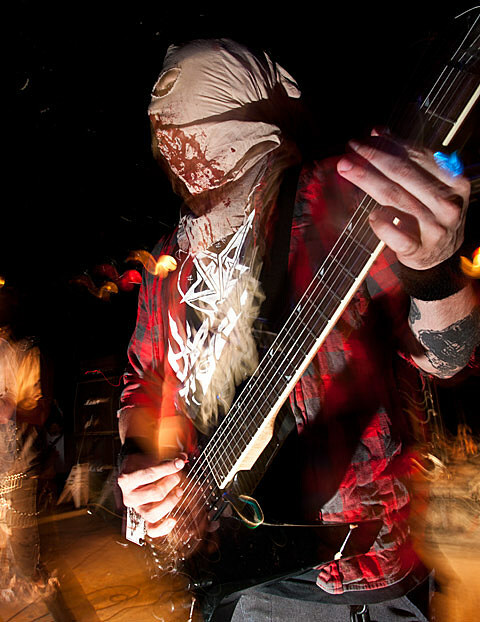 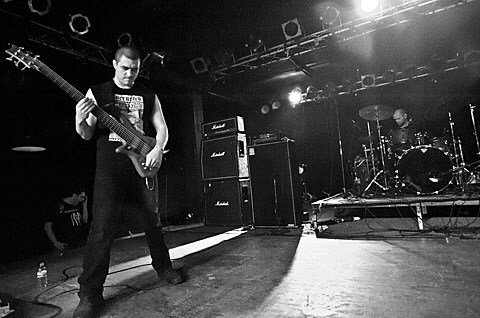 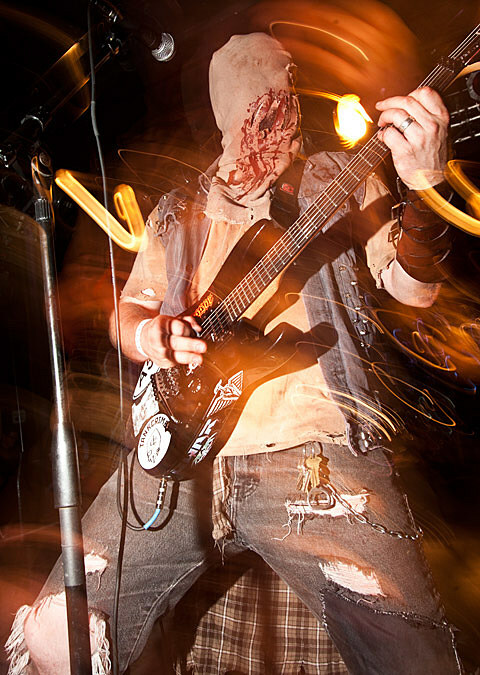 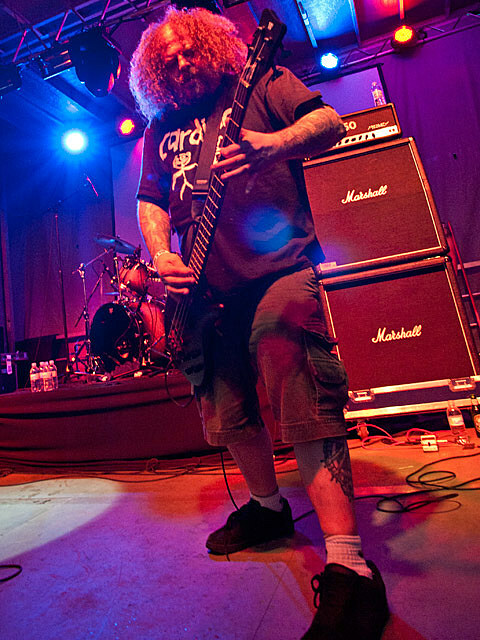 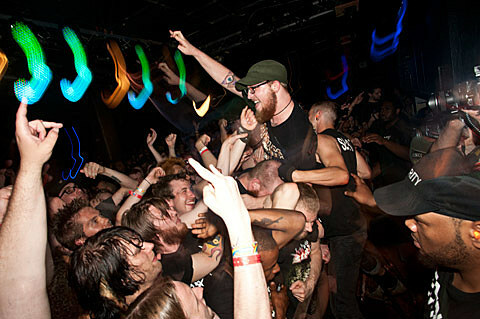 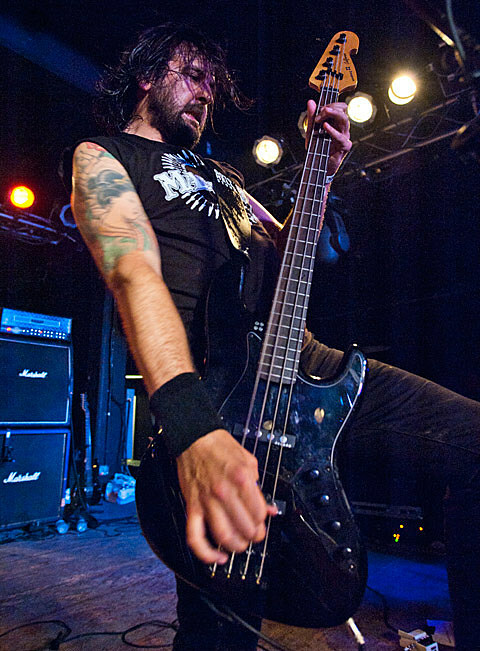 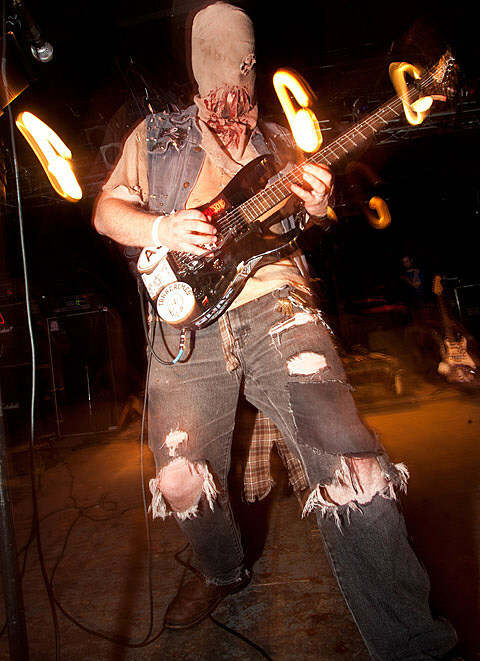 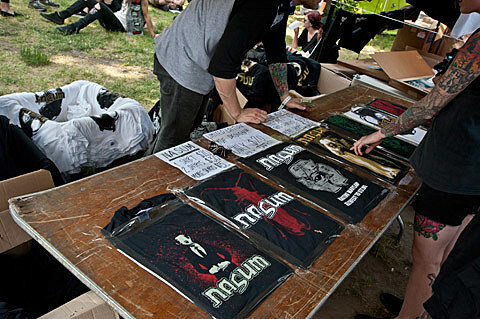 More pictures from day two at Maryland Death Fest are below. 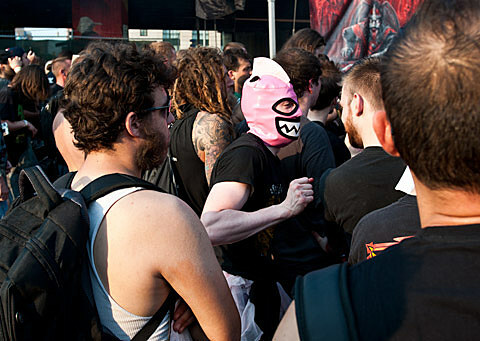 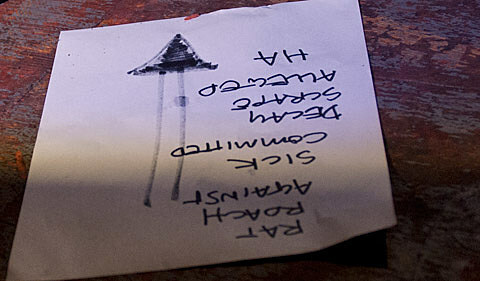 If you missed it, check out day one pictures HERE and a set of Rorschach’s pictures HERE.